I do not know how professional photographers manage all the photo organization required for their work. It must take weeks! Due to an issue with my iPhone recently, where photos were not downloading or deleting appropriately, I was scrolling through thousands of my photos the past couple days. The good news is I think I fixed the download issue, but the process made me reminisce about the past year as I looked through batches of photos from 2016. I thought it would be kind of neat to share a few at a time, indicating what was going on here. I’m not going to change the order – so, here we go. Oh yah – This is a beautiful mum, don’t you think? Mums will return in pots – sometimes – after being stored in an unheated garage for the winter. I’ve had success with doing so – and basically, I cut off most of the top, roll it into the garage with my hand-truck in late fall, and give it moisture if it needs it. Most of the time, the moisture is in the pot when I roll it into the garage in late fall because the pot is so large and wet from rainfall. But I will check it and if looking bone dry, put snow on the top, if there’s snow! I took this shot too. Notice my red banana plant (Ensete) in the background on the right. As you can see, it is looking a little tattered as we approached the fall’s frost. But before this, this red banana plant was very happy in this spot which is the north-west corner of our house. In the mornings, it is shaded, but as the day progresses, it gets sun but not extremely hot sun, and later in the day, as the evening approaches, it gets shade again. Also in the background is a pot which has rhubarb (Victoria) and an elephant ear plant (Colocasia ‘Black Magic’). The elephant ear plant was really extravagant looking with bold, rich black leaves. But the rhubarb was “done” for the season. Before this stage, the leaves of the rhubarb were large and a great contrast to the dark elephant ears plant. I liked how the rhubarb’s leaves were ruffled too. It added a nice texture. Plus, these will overwinter pretty nicely in the big pots when the pots are moved into a protected location, like my garage or shed for the winter. During these photos, it was fall clean-up time. This shows 3 long window boxes which have oregano (left and right) and thyme in the middle. They were moved to my low-temperature greenhouse and are still doing quite well in the middle of winter. Oregano is an excellent container garden plant because it stays contained, whereas in the garden, it is a spreader. It serves well as a spiller and filler in larger pots with mixed plants. I used it a great deal this past year for dishes during the summer. I loved it with feta cheese in particular when I would toss a salad or pasta dish. Add some tomatoes – and you are ready to eat! I grew up on a property which runs along the Scantic River and my husband and I go there for walks sometimes. The river was very low in this shot. When I stand at this particular curve in the bend of the river, memories from my childhood fill my mind – every time. We swam here sometimes and I fished at this spot with my younger brother, Jimmy. He taught me how to catch night crawlers the evening before fishing day. We walked the yard with flashlights – usually after rainfall because they come to the surface. Those are good memories. Today, I don’t care for putting a live worms on fishing hooks, especially night crawlers – but back then, it was no problem. Know what this is? A Catalpa tree. Native to our area. We had a huge one in our backyard – it is still there actually. They can be messy because of their extremely long seed pods which fall to the ground, and require clean-up before mowing the lawn, which my father did every time. This one is at that spot by the river. The sky was a beautiful clear blue that when I looked up at the tree, I quickly snapped a photo. During my studies at UCONN, we were required to propagate a tree or shrub, or grow them from seed. I asked my professor if I could grow the Catalpa tree because my parents’ landscape had them and I grew up with those trees. He responded that it is basically a weed, but yes, I could grow them. I collected the long seed pods, and had many baby Catalpa trees in no time after laying the seeds on a bed of peat. They germinated easily and quickly. 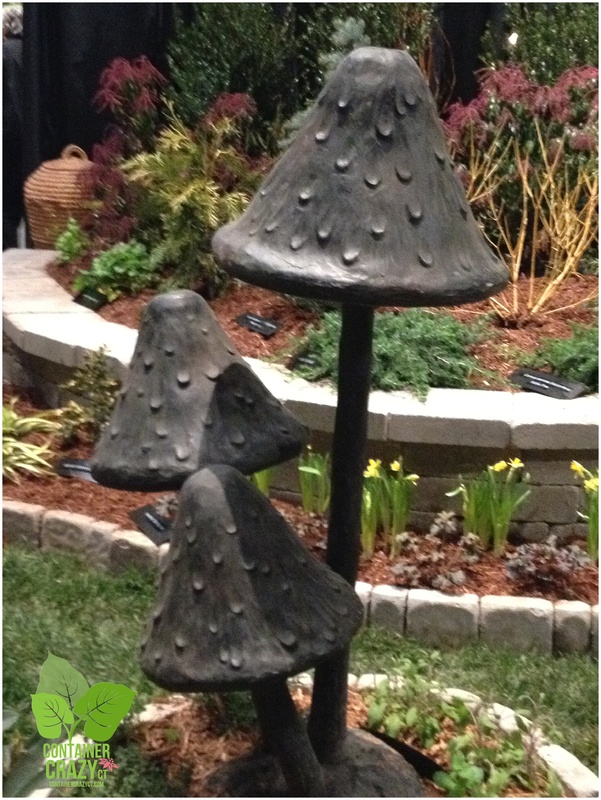 Ironically, when I did some landscape designs years later, one client really wanted these because they are native. Things change. Natives are not considered weeds. Actually, I think what my professor was implying at the time was that it is not the type of plant he wanted me to grow because he was teaching nursery production of marketable landscape type trees, but when he understood I had a fond memory of them, he agreed to it. Plant people – no matter how smart or experienced – have that “thing” about understanding the passion for nature and plants. As a last thought on that professor – he came to me when I got my first job at a nursery to do a design for his wife. I remember feeling surprised and of course, intimidated cause he was a tree master. I think it came down to he just wanted someone to help his wife. This week, I’ve been posting pictures of a Cecropia Moth (Hyalophora cecropia) – well, not the moth itself yet, but its caterpillar stages before becoming a moth. On Monday of this week, he moved to the base of a plant he’s been feasting on and began the process of making a silk cocoon. I’m glad I caught the very first stage of it – and was able to take pictures every couple of hours during the afternoon. I was surprised he squished himself in the base between stems/branches, and the plant label, which I never removed. The label makes a great supporting wall for him. I didn’t see him move at all when I would go out to take a look and photo. In fact, every time I stepped out to take a photo before, he would stop moving usually and pull his head into his big body during his eating cycles in the mornings prior to the cocoon making. Upon reading and looking it up, I discovered the Cecropia Moth (Hyalophora cecropia) is “North America’s largest native moth” – and it is noted in references that “females can get a wingspan of six inches or more.” Cool. So it is a neat find and I’ve enjoy watching its progress. As odd as this may sound, I have a memory from childhood of seeing a huge butterfly on a bush and running to get my parents to show them. Later in life, I thought, did I imagine this? – but I remember it being huge – similar to the photos of this moth. I will have to ask my parents if they remember this at all, or if I imagined it. Anyhow, today, I think I’m going to prune the plant back and put a netting material over the top so nothing can get at it during the rest of the summer and into fall. In the winter, I will either move the pot into my garage because it must experience the normal temps of winter, or put it under my steps in the front of the house. I went to a website and asked about it – and they recommended these steps versus bringing it inside or putting it in a grow room which would be too warm. From what I’ve learned, this moth, when it comes out – will only stick around for 2 weeks, and it is rare to actually spot the process of it coming out – but I do not want to totally disturb it and let nature take it’s course too. It is more important to me he makes it than to witness it changing into a huge, beautiful moth. Especially if it only lives for two weeks. Ironically, earlier this season, I found black caterpillars feeding on a plant by the side of my house in a different area. I even posted a video of them and remember saying, I don’t know what they are, but I don’t like that they are eating my plant – Well, I suspect now they were the instar versions of this caterpillar because I’ve been looking at the pictures online of it’s growth process online. Its cocoon basically got thicker and darker colored during the afternoon on Monday. By the next day, it was very dark brown where you can’t really see the caterpillar anymore inside because the layers are so thick from the silk. He will change into a brown casing (chrysalis? I don’t know – I’m not a bug expert), eventually inside – similar to what is depicted in the Silence of The Lambs movie – like that. I am “not” gonna open it up though. I discovered another insect “thing” yesterday – I put out some glass jars on hanging hooks, and the rain filled one partially. There was a beetle floating around – deceased sadly (drowned), but I noticed little movements of its babies on its back. This stuff fascinates me – nature always has and always will, and I felt a little bad for the mommy – even for an insect I have these feelings at times. Not all the time though – not when they devour other plants I adore. Clethra alnifolia, commonly called summersweet, is a deciduous shrub which blooms this time of year, and has an intense fragrance. I have only one in my yard, but I look forward to seeing and smelling it every time it starts up its white flowers. Yesterday, I walked up to it – and of course, iPhone in hand, and I saw a bee kind of sleeping on an upright panicle (flower heads). As I moved closer to take a shot, his little arm would jump up as if he was saying stop coming towards me – it was comical – like a reflex. Eventually he got annoyed with me and flew away which I caught on a fast video taping and his one little arm was raised like he was saying goodbye as he took off. No Joke! LOL. Because people are very interested in helping our bee pollinators – this is a good shrub to add to your landscape for late summer blooms to give the bees a boost – and they are certainly enjoying it right now. 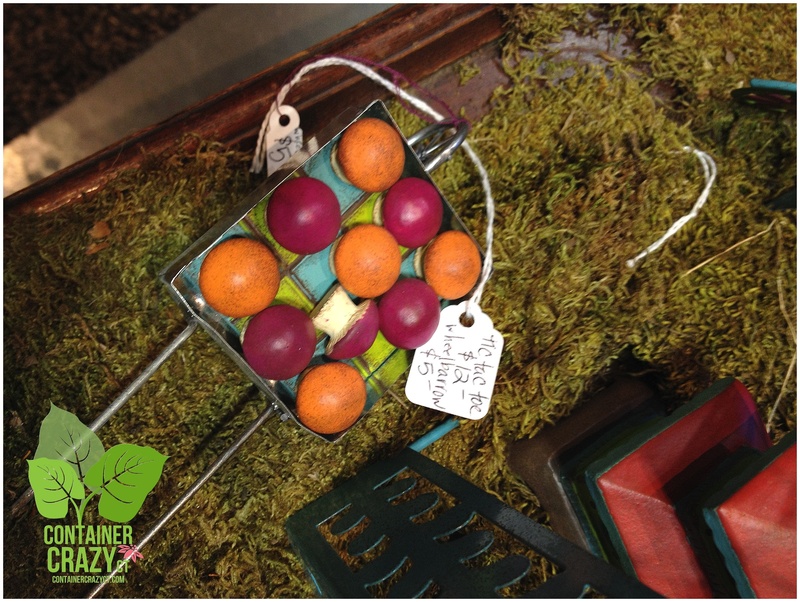 Also, we posted a photo of samples of the art pieces we will be making in our September 10th workshop called, “Garden Art Creations” – with wine bottles. Laura Sinsigallo of timefliesbylauralie is our Special Guest Instructor. She developed three prototypes to show us what we are in for! I can’t wait. $35 pp – Includes a pre-cut wine bottle per attendee, art pieces to embellish, instructions by our Guest Artist Speaker, wire, etc. 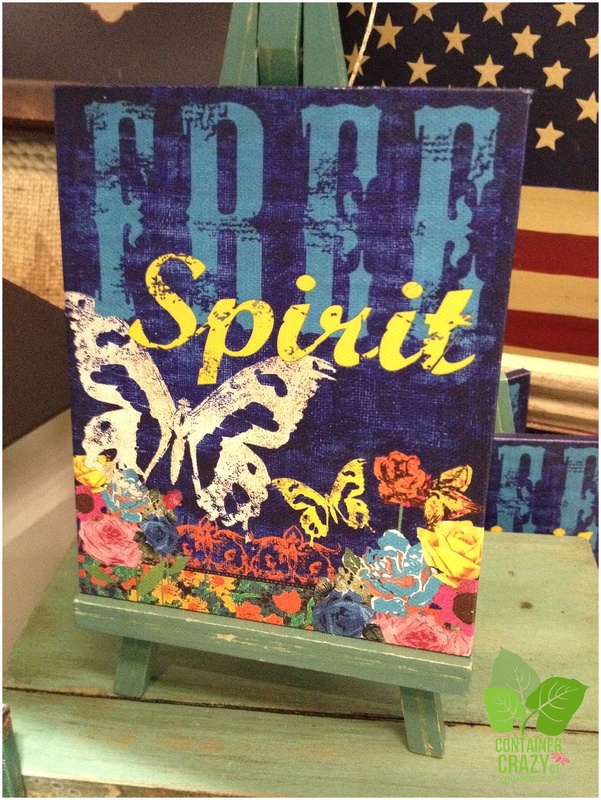 You may bring additional art pieces to add and should bring your own wine corks. Bring own wire cutters if you have them. Laura Sinsigallo of timefliesbylauralie. Laura is a returning Guest Artist at our workshop. 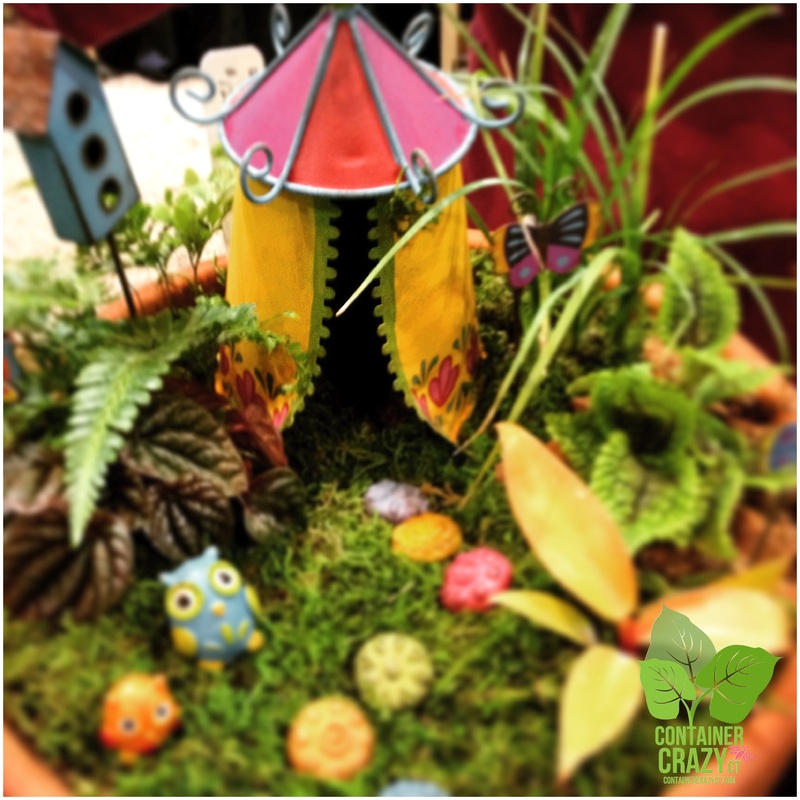 She taught a wind chime making class in 2015 and we are happy to have her return in 2016 for this workshop. The date for this workshop has been scheduled for September 10th, 2016. Please refer to our www.WORKSHOPSCT.com site for more information, to register via Eventbrite on that site, or see our Facebook EVENT on Container Crazy CT facebook wall. Registration and pre-payment is required. Seats are limited – so please don’t wait if you would like to join us. It will be held rain or shine, and if a nice day, hopefully outdoors. Enjoy your surroundings everyone – it is there for us to enjoy. Even without Pokemons (did I spell that right?). When another website or blogger links my article to their’s, I receive a notification. 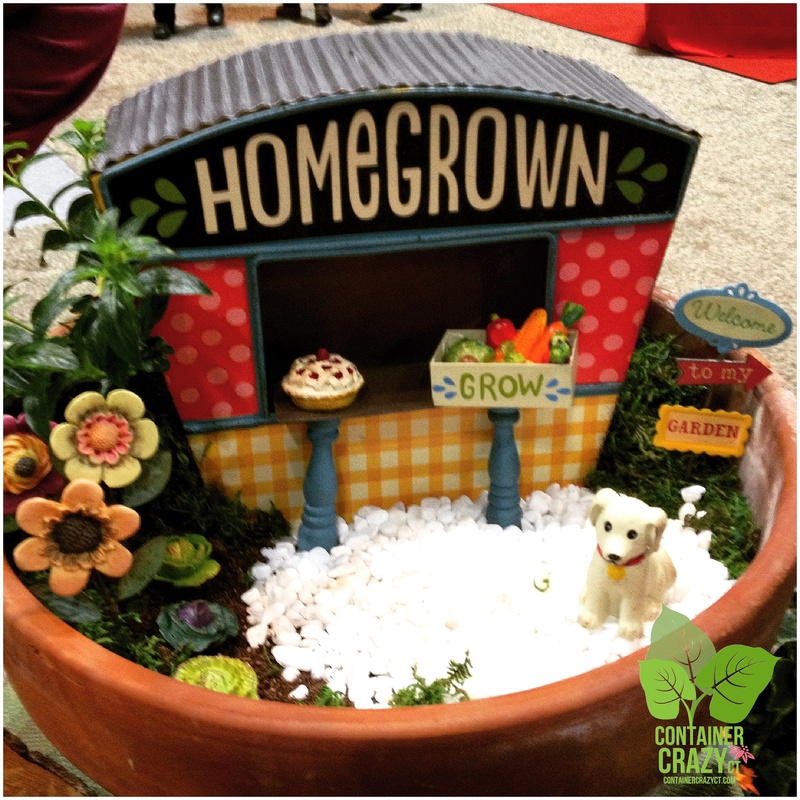 This is how I discovered M&M Wintergreen’s post about 2016 Gardening Trends. 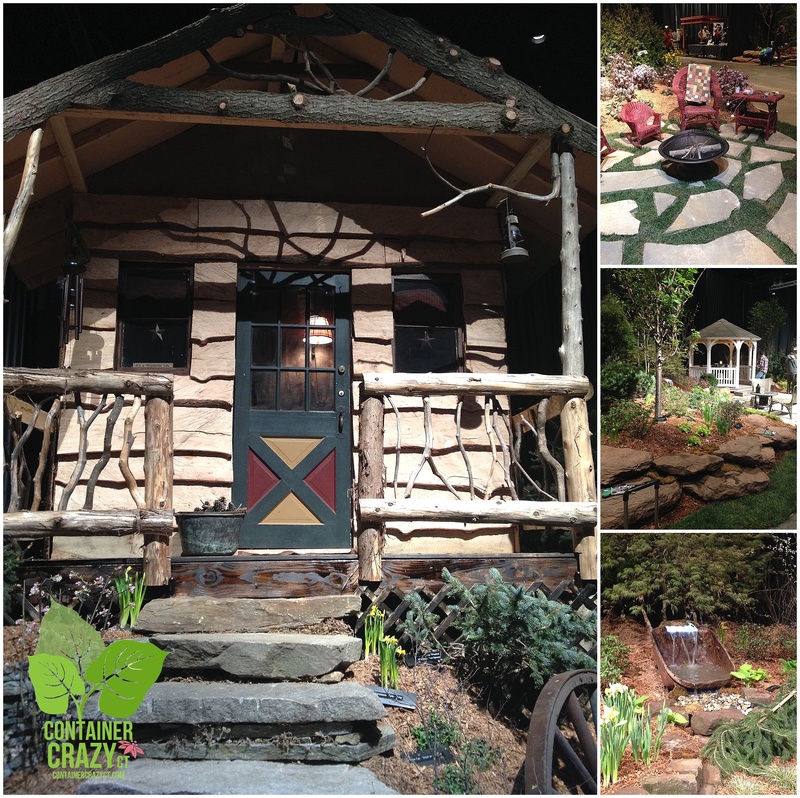 I’ve been wanting to write about garden trends because I share them every year at my garden presentations, but as I read M&M’s blog post – I thought they did an AMAZING job of capturing the essence of several trends. I particularly liked how they showed the way in which their company’s products support these popular trends in various ways. Thus, I’m re-blogging their post (with their permission) to share with you. Be sure to check out #9 – That’s where my blog article is linked. I agree with everything they wrote and especially the “toilet brush” tree comment which made me laugh. Oh gosh, we don’t want trees made of toilet brushes! LOL. P.S. Check out my new Blog Site specifically created for this year’s workshops, called www.WORKSHOPSCT.com, where, of course, my annual Holiday Kissing Ball Workshop with Greens is listed. The temperatures are getting a little colder here in Connecticut and the misty rain is making things outdoors a bit damp, but it will not dampen my spirits – In fact, it will make them even brighter. 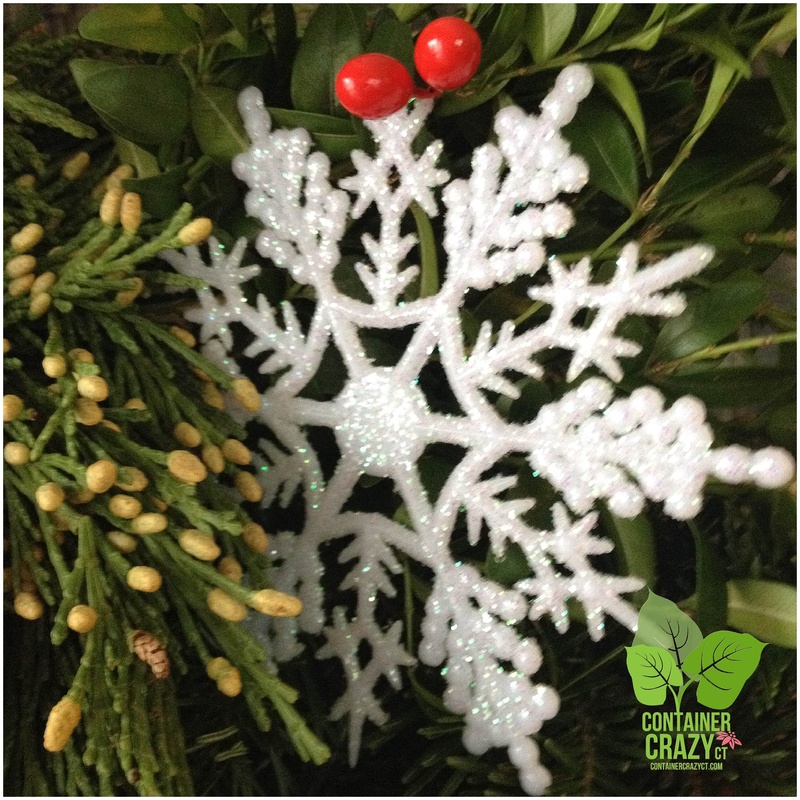 As my big Kissing Ball and Holiday Evergreen Creations class is approaching – in only 3 days – I welcome the colder temps and feeling of winter – It also helps me to maintain the goodness of my specially ordered mixed evergreens for this weekend’s class. This year, we have lots of newbies in my workshop. Some of them seem a little nervous, saying or texting things like, “I’m not crafty” and “I want to sit in the front of the class,” but I believe they will surprise themselves. All my attendees end up making something amazing and they impress me every year with their talents as they decorate the kissing balls and wreaths. I learn from them as well. But after the class, they may be wondering, how do I keep everything fresh? 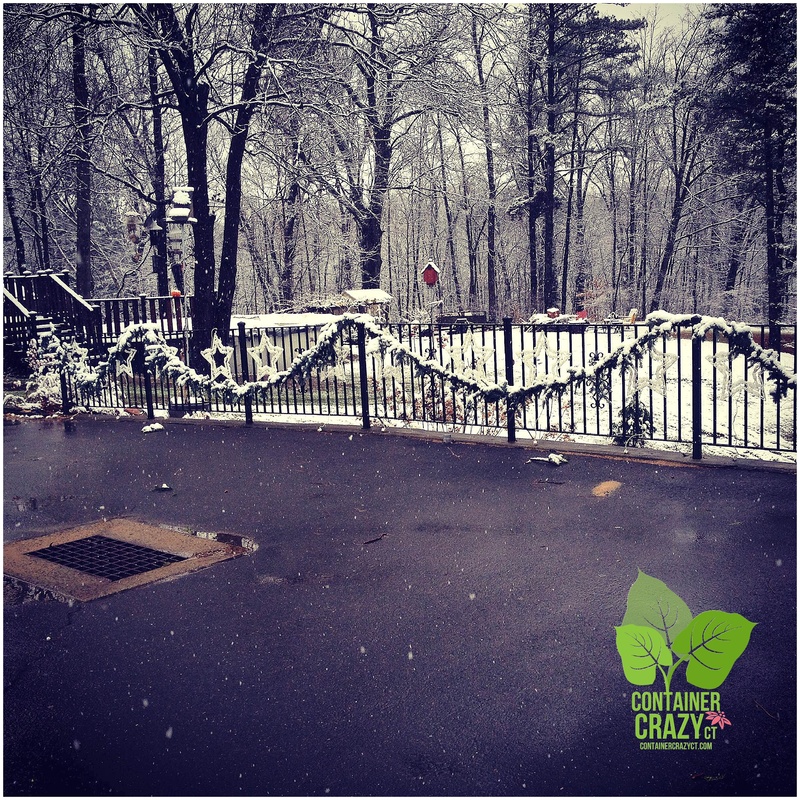 For starters, the cold weather really helps – and it best for them to keep their newly made holiday arrangements with fresh evergreens outside. The natural moisture from misty winter rains and upcoming snow falls outdoors keeps the greens just right. Colder is better to retain needles. But, the type of evergreen also determines how it will fare in the weather after being cut and inserted into the mechanics. For example, fir and balsam trees cuttings last very well for a long time. Their needle retention is pretty good – that is why people like them for Christmas trees. It is also important or helpful, but not mandatory, to keep your wreath or kissing ball out of direct sunlight and wind. The wind may dry out the needles somewhat faster than if located in a protected place outdoors. You may hang your kissing ball indoors – like from a ceiling fan or chandelier, however, it will dry out faster in a warm house. 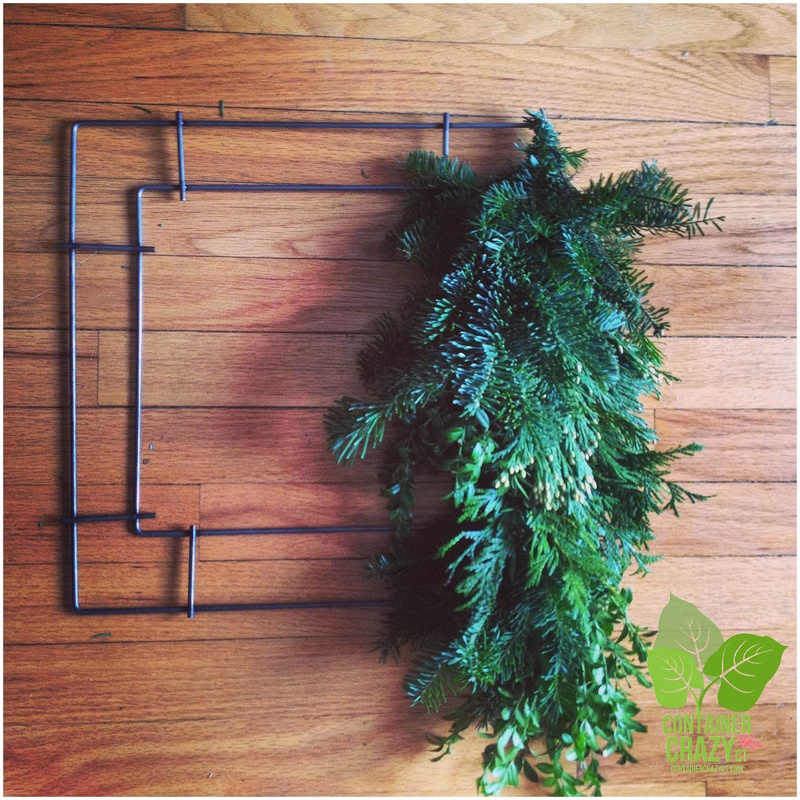 If you really want to do that for décor during your festivities later in the month, a good tip is to hang it outside the weeks or days before so it stays cold, and move it to your indoor location a couple days before your holiday event. 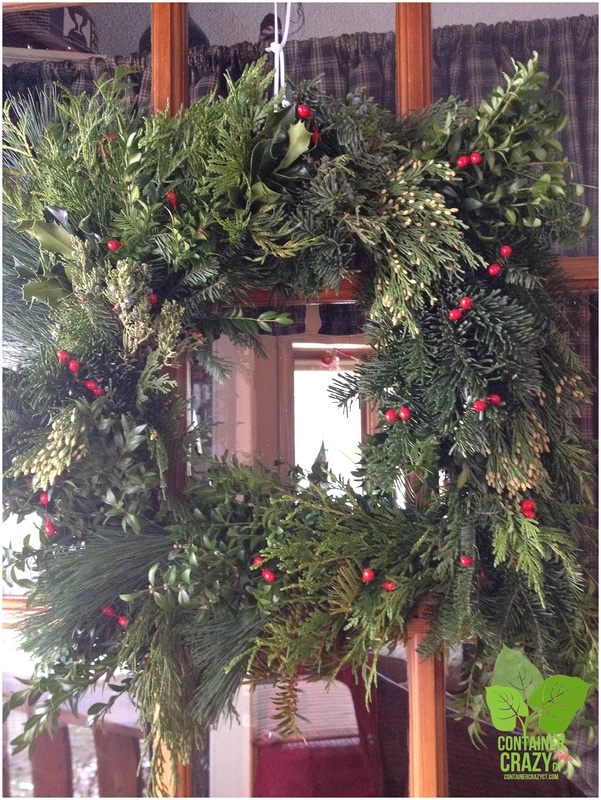 And be sure to keep any holiday arrangements with fresh greens away from hot rooms heated by wood stoves. That will surely dry them out. I also recommend any candle centerpieces are kept in the coldest room possible before you display them at your holiday dinner table. I find my kissing ball, hanging outside by my steps lasts all the way into February with no problems at all. I remember one year, it was hanging there on Valentine’s Day covered with snow and red fake carnations but it was soooo beautiful even then. 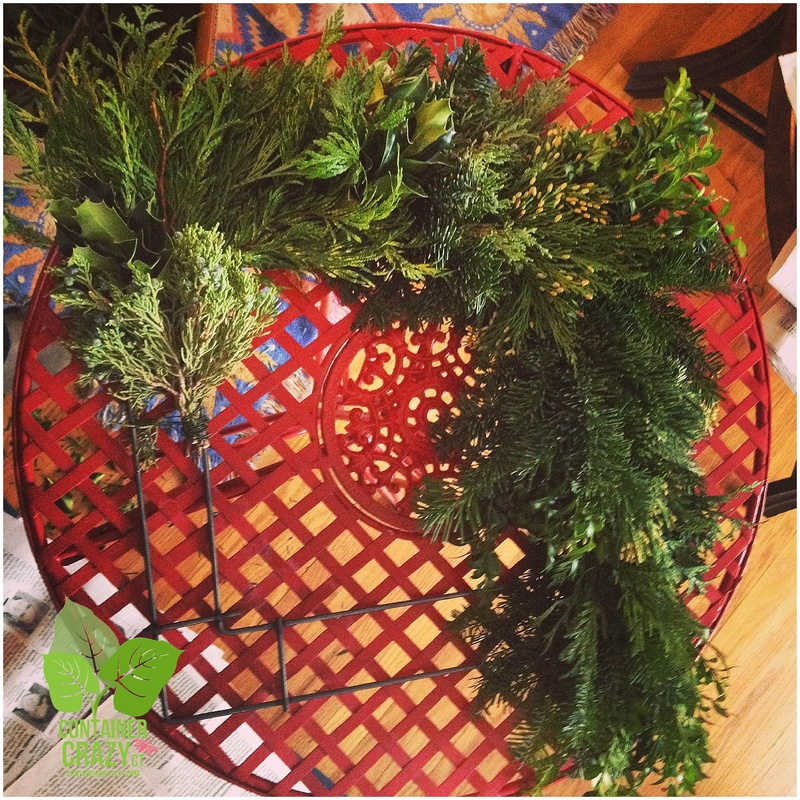 It also helps if the greens are purchased or picked fresh of course, which is one of my goals every year for this workshop. Timing is everything. 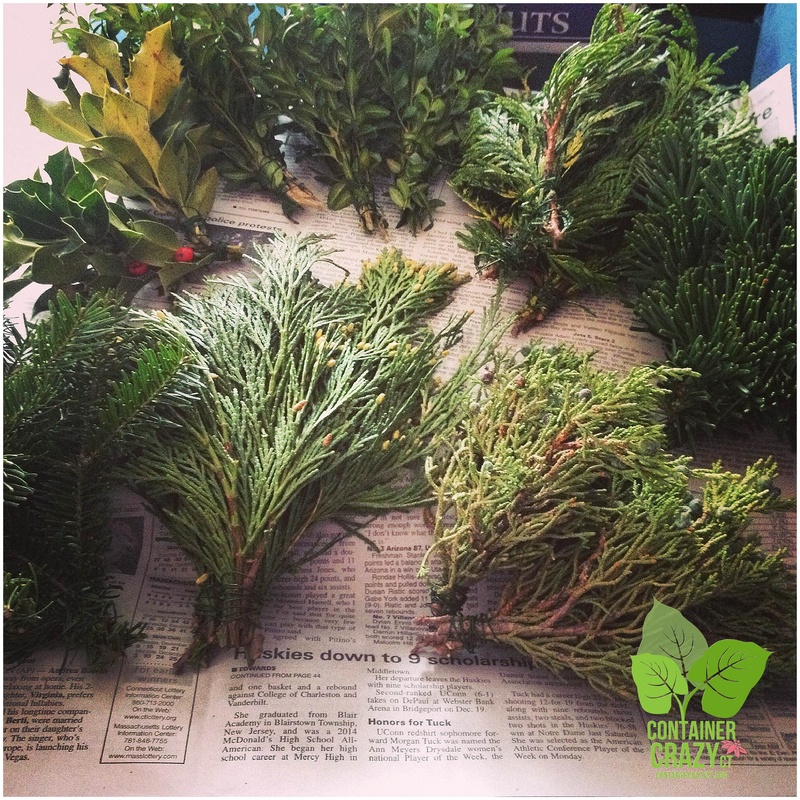 If you get greens from your yard, wait until you are ready to arrange them to cut them from your branches, or do it the evening before if possible, and take them when it is cold outside (not warm). 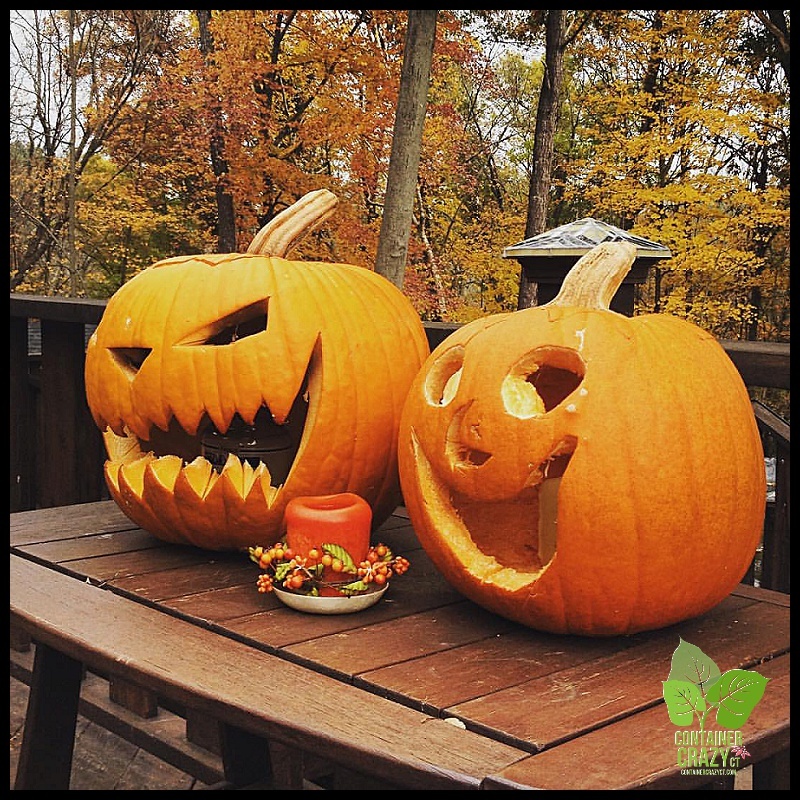 Also, I recommend you cut them before any major wet type freeze falls on leave leaves or needles – so be sure to watch your weather forecasts. Regular Size Boxwood Kissing Ball – Color Lasts a Long Time! 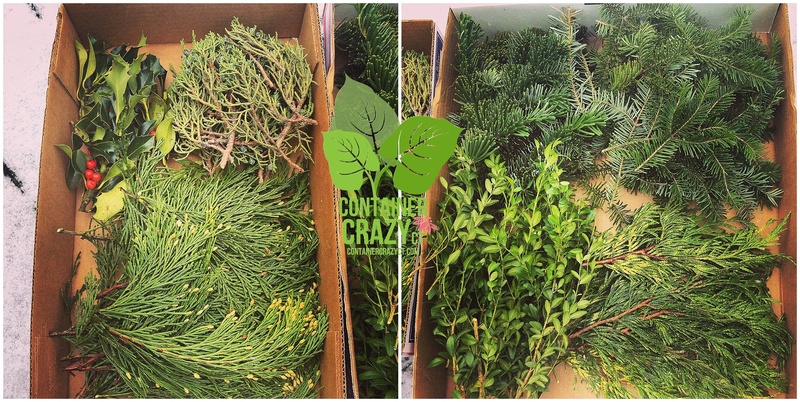 Other types of evergreens which last and have a nice color in mixed arrangements are juniper, incense cedar, white pine, and as noted above, fir and balsam. The white pine may dry out a little quicker than the others, I have found but no worries, all will be fine. Hemlock branches are very pretty and they tend to arch which I like in container gardens outdoors for holidays, but they will loose their needles a little faster than other types. 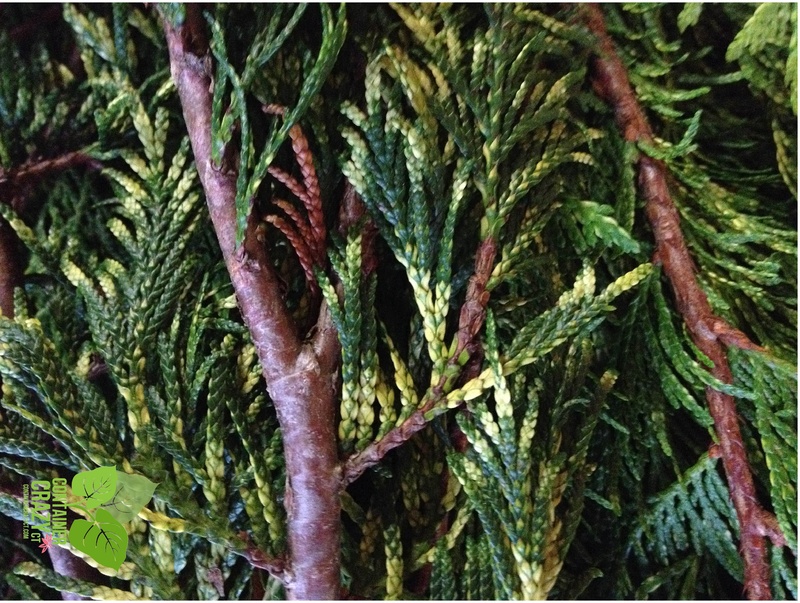 Yew, with its dark green needles, is a great candidate and lasts. For some reason, it is not as popular but I think it looks marvelous and adds a layer of texture in the arrangements. One new item this year at my workshop, which will be a surprise to my attendees unless they are reading this blog post today, is berried Eucalyptus. This has a beautiful blue coloring and texture – and I’m excited to share it with everyone on Saturday. 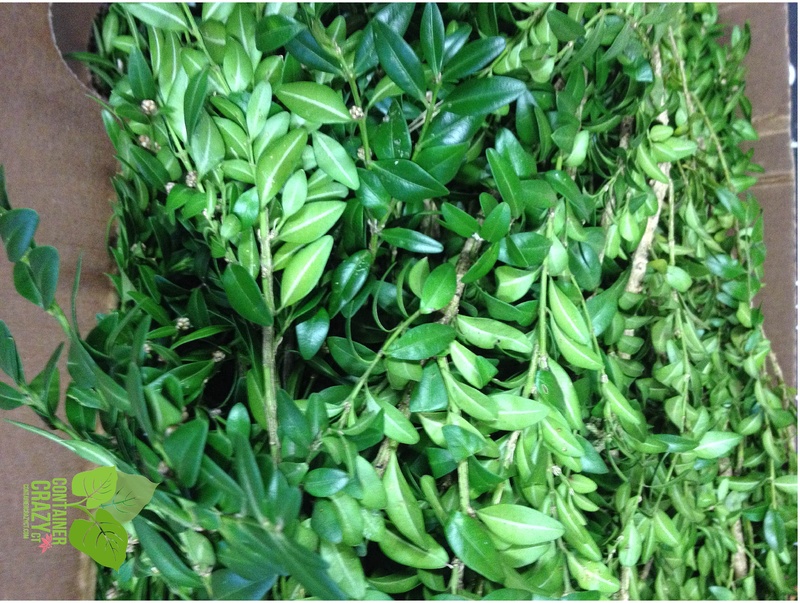 Boxwood is another excellent, quality green in arrangements for the holidays. One big benefit is they have no sticky sap and they maintain their dark color even if they get a little dry over time. 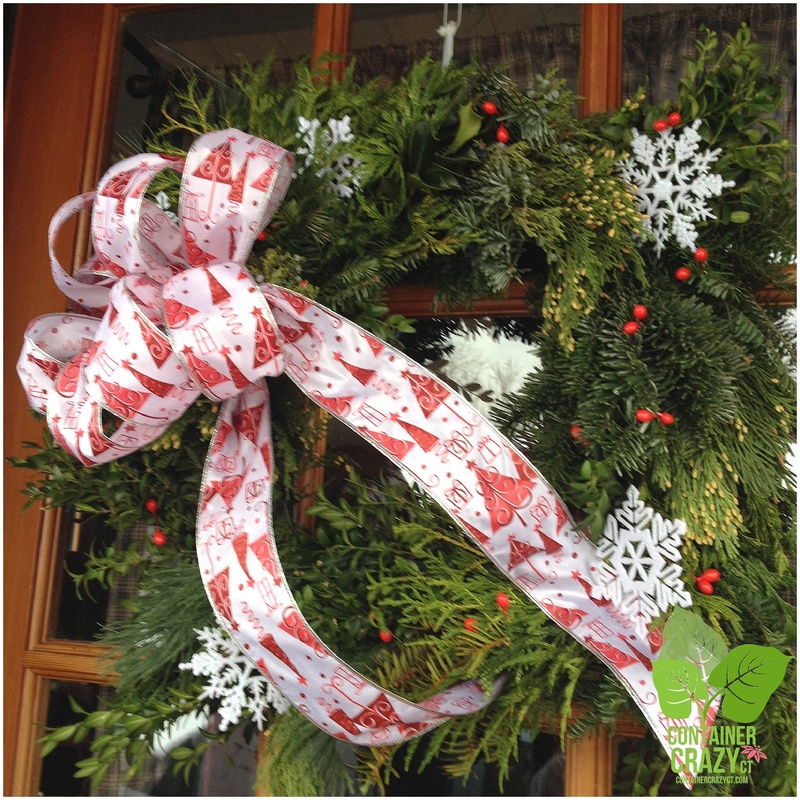 I absolutely love the classic look boxwood cuttings give to kissing balls and wreaths. Boxwood along with Pine may be soaked in water prior to your day of arrangement – if needed to re-hydrate, but often it is not required. Holly can be a little tougher to work with because those spines are SHARP. And holly may turn black if it gets wet and then freezes, but I don’t see this situation too often. By the way, this year, we have variegated Holly – wait til you see it – oh, la, la, fa, and la-lah. Its gorgeous. One year, perhaps next year, we will add magnolia leaves to the mix – they have shiny tops and brown undersides to their leaves, and it adds a really nice texture to holiday evergreen arrangements, especially on wreaths. There are anti-desiccant type products you may spray on your greens to help retain moisture, but to be honest, I don’t bother with that – and everything has lasted well for the holidays. Last but not least, cutting the ends of your greens from fresh branches with “good sharp pruners” is important. It not only helps with the insertion into your kissing ball mechanics, but allows water uptake if you set your greens in a bucket of water the night before or if you are using hydrated floral foam. Timing is probably the most important of all (along with cold temperatures). Everything is timed in the background – lots of busy growers, distributors, and buyers do everything they can to time the harvesting of greens at the right time to shorten the length it sits out – and if too early, that’s not good – if too late, not good either. It has to be just right. I do my best and feel like Mrs. 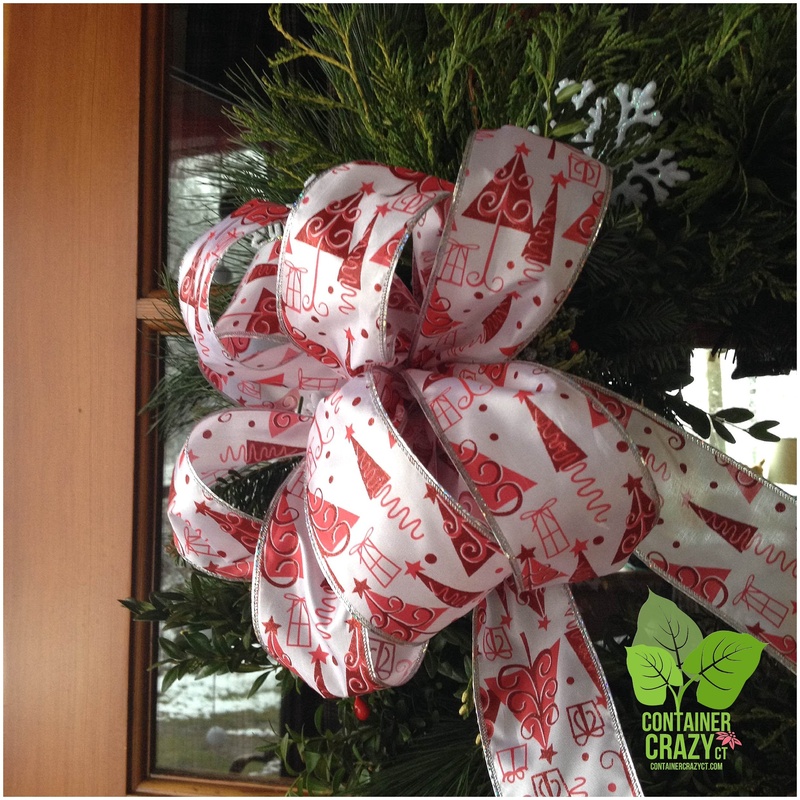 Kissing Ball Clause as I prepare all for holiday workshops – I feel this magical spirit as I get everything ready – maybe that is what drives everyone in the business of selling Christmas trees, making wreaths to sell at stores, and arranging workshops. They end up working outdoors in the cold or rain but keep on. We are those elves doing whatever it takes to make all merry. 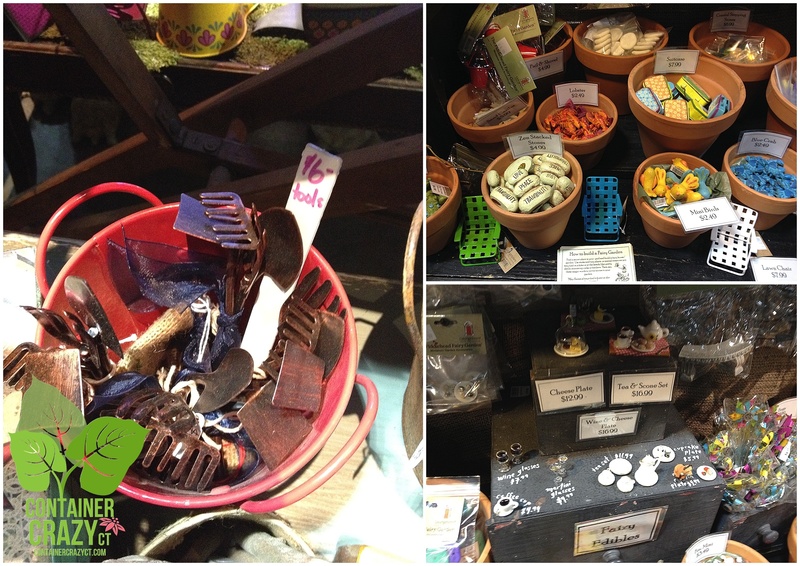 Container Crazy CT has Gift Cards Available – See the Menu Bar above – A Great Gift Redeemable Towards Future Workshops! John Viccellio from Stallings, North Carolina is the author of a blog titled, “A Walk in the Garden.” I never met John in person, but I’ve been enjoying his blog posts for quite some time. 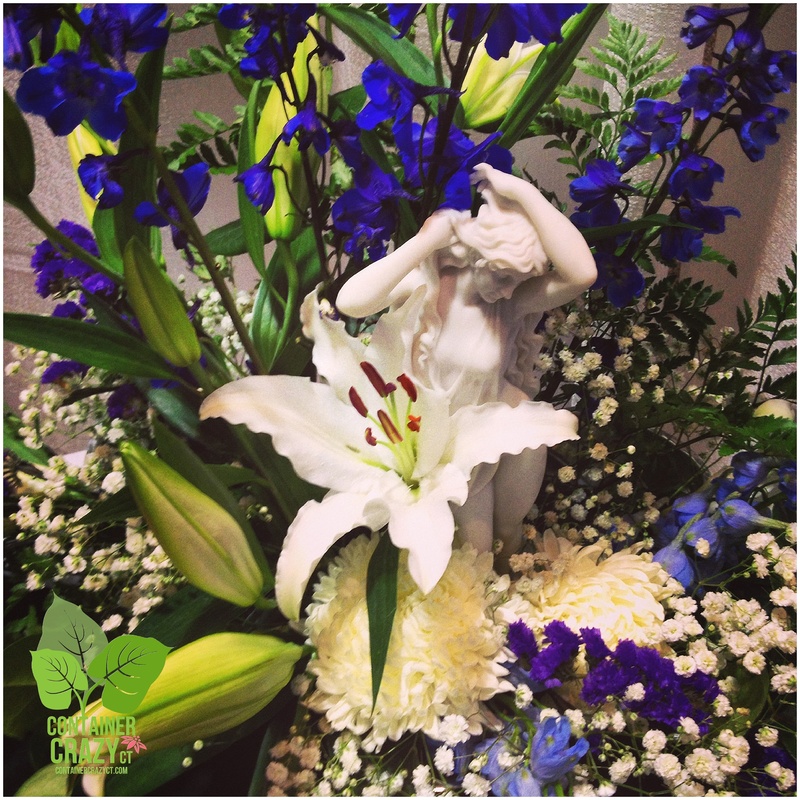 He regularly posts photos of cut flowers collected from his gardens which are arranged in vases. Actually, I believe his wife is behind the vase selection and arrangements. He refers to her as his Arranger, and she does a wonderful job. 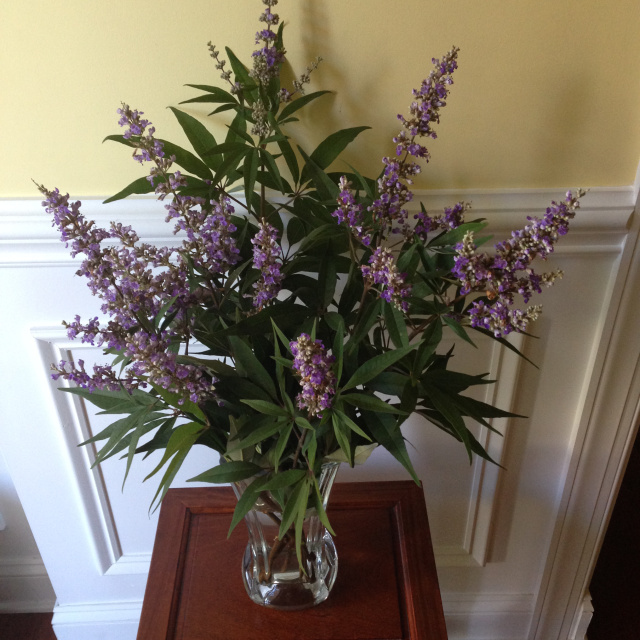 In addition to the various vase photos on his blog, John writes about plants growing in his North Carolina gardens. From time to time, I’ve admired the plants he is growing which I wish I could grow here in my Connecticut yard. However, John’s planting zone is a tad bit warmer than mine. He is in a zone 7 area, and I reside in 6a. But not is all lost, as some of the plants he can grow easily in his area are candidates for container gardens or patio pots in mine if they are not winter hardy here. One day, I spotted a gorgeous photo of a chaste tree growing in John’s gardens via his blog posting. He had them ‘arranged’ in a vase and the soft blue to violet colors of this plant, along with its long narrow blue-green leaves situated like fingers from a central point, caught my attention and admiration. I don’t know why, but plant lovers just fall in love with certain plants, and this is one I’ve always liked. I don’t see this plant (technically a deciduous shrub which can grow to the size of a small tree) offered for sale here in Connecticut often. They are hardy to planting zones 6 to 9 (or zones 5-9 depending on which plant reference you look up), so they are considered, what I call semi-hardy in our planting areas because they do not hold up well during harsh winters. If the winter is not harsh, I guess your chances are better. Also, where they are planted matters in regards to the soil and exposure because they prefer full sun and well-drained soils. Bottom line is the plant will die back (dies to the ground) in severe winters. Its roots may survive to regrow the following season if all goes well. The only other time I’ve seen a beautiful specimen of the chaste tree was when I toured a Connecticut garden via the Connecticut Horticultural Society’s programs. It was growing in Steve Silk’s amazing gardens amongst other trees and shrubs on his property in Farmington, Connecticut. Steve is a former newspaper photographer, travel writer and was managing editor at Fine Gardening magazine. He held the role of President for the society for several years. Steve also has cool tropical plants in container gardens staged in various areas on his property, which is why I was happy to be seeing his gardens that day during the tour. But as I walked his yard, I remembered spotting the chaste tree and running my fingers along the plant’s foliage, again thinking how I wish I had one of these trees. I should have asked Steve how he managed to keep one growing in his garden due to it being a bit sensitive to our winter climate. Of course, an alternative option, when desiring a specimen that is not totally cold hardy here is growing them for enjoyment in your container gardens during our summers and then overwintering them if possible in frost free places in the fall and winter. Many times semi-hardy plants will survive this way. I can envision this chaste tree right now growing in a large container garden, and would pair it up with other plants showing off soft color tones, like pink, soft yellow, or other blue to violet flowering plants. If you browse John’s blog, A Walk in the Garden, you will see the other color of flowering plants he put near his chaste tree in his garden, some were hot pinks which worked well. This deciduous shrub is a long summer bloomer, and as John noted on his blog post, it can be deadheaded for re-bloom later in the season, which he has done for twenty years on his plant. 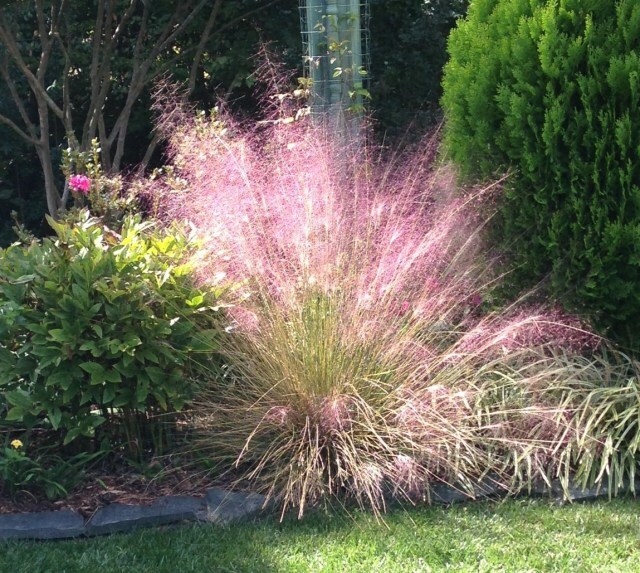 It was a grown from a second generation cutting from its parent at his Aunt Martha’s home in Chatham, VA.
Then there was another day when John posted the pink Muhly grass photo from his gardens. Oh my God, I thought. I just LOVE that grass, and wish I had one here. 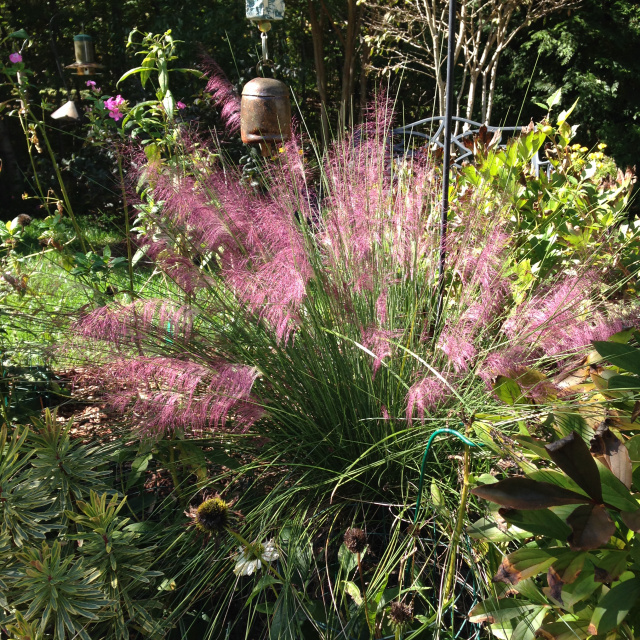 The photo was especially beautiful because of how the sunlight captured the bright to soft pink colors of this fine textured ornamental grass in his garden, and I especially like how delicate this perennial ornamental grass looks and feels. Again, depending on which source you look up this grass, it is hardy to zone 6 or zone 5. John noted that its a native, so his climate is ideal for its growth.”In October it was glorious,” he wrote, “…as the sun seemed to ignite its pink seed clusters.” I couldn’t agree more, it is electric – Just look at his photos! Ah, I thought as I read his words and admired the photos he posted, I can imagine this vision on a fall day. Selecting a spot where the sun would hit it would be ideal in the landscape or garden, or again – in a container garden or patio pot. I can envision it in a cobalt blue pot, can’t you? 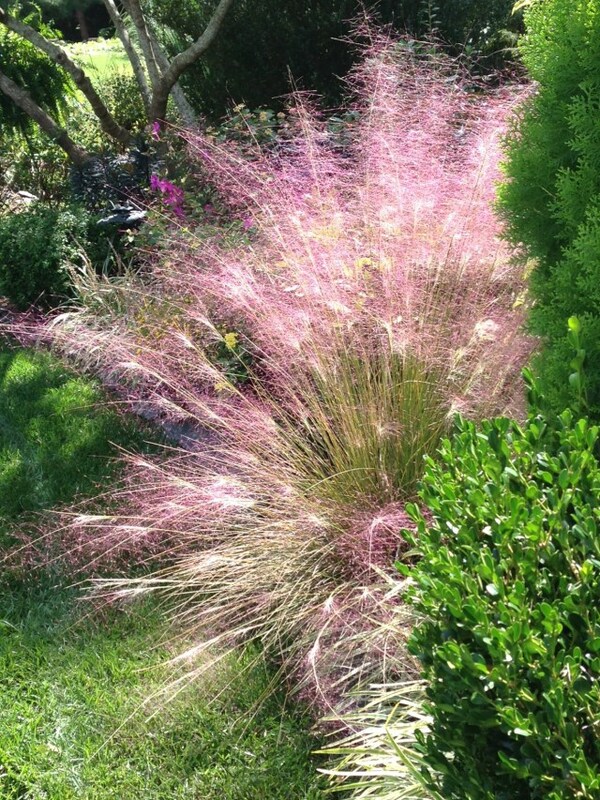 One day, on a day which some bloggers call, “Wordless Wednesday” – John posted two photos of his pink Muhly grass with no words or text because, it was “wordless” Wednesday, and it was enough to see just the photos, let me tell you – this grass is captivating. A Walk in the Garden blog shares beautiful photos of the grass growing in their gardens. John has been kind to follow my blog, and I follow his – but I really don’t remember who discovered whose blog first. So, recently I asked him to answer these following questions as a fellow follower – and wanted to share his blog site with my readers so they may enjoy his gardens too. What attracted you to Container Crazy CT’s blog? 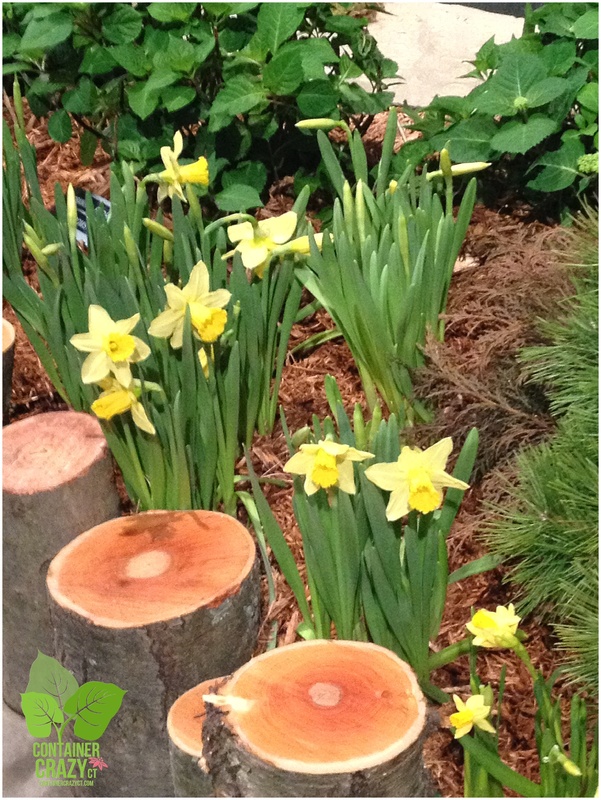 What is your favorite plant or way of gardening? And by the way, John Viccellio is a retired U.S. Navy Veteran – so, in addition to thanking him for his online contributions, gardening style, and demeanor expressed on his blog regularly, I’d like to pass on a sincere thank you to John for his service to our country in honor of Veteran’s Day which was two days ago on Wednesday. 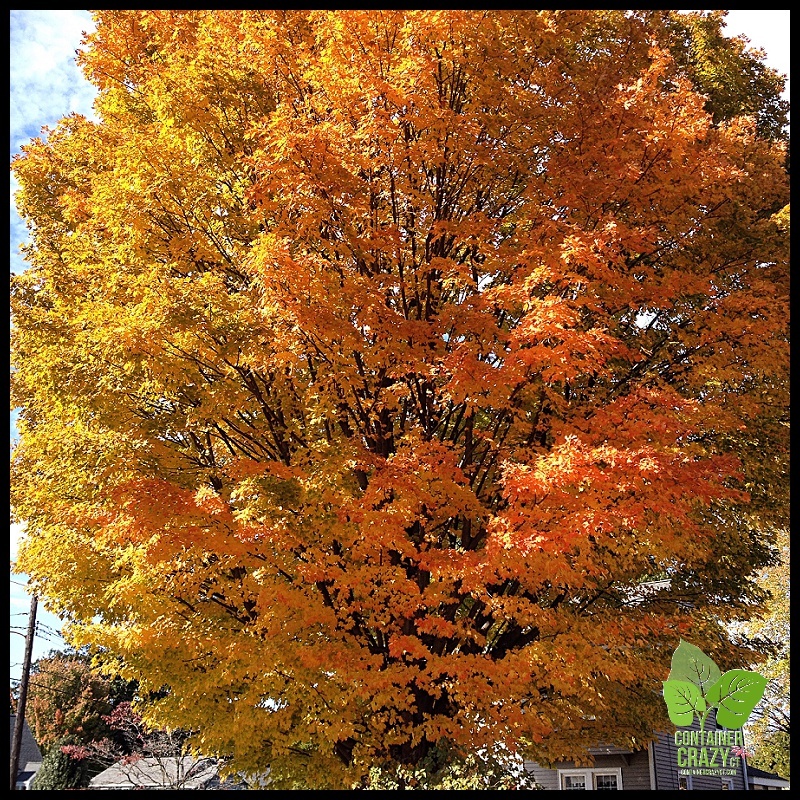 The fall colors we have been experiencing as the trees’ leaves changed to red, orange, and yellow this year in Connecticut have been so spectacular, well – it is nearly impossible to put into words. There have been moments when driving where you may have been blindsided by a turning in a curve when you see the beauty of it all. A street that is ordinary in your hometown has suddenly turned into a light show of vibrant eye candy, and you may have pulled over to take photos, but many times, those photos do not capture what you see through your eyes or through your polarized sunglasses against the clear blue skies and bright sun. However, this month, a friend posted a photo which blew me away. Not only were the trees covered in the mixed colors of fall, but the ground was as well. Vibrant reds from low growing wild blueberry bushes provided an affect one doesn’t often see – unless you live in Maine, which is where my friend resides. This friend, PJ Walter, is a person I met many years ago when my husband and I stayed at his inn which he co-owns with his partner, Frank. When we met PJ and Frank, the bond was instantaneous – Let’s just say, they are great people with a wonderful inn located in Rockland, Maine, called the LimeRock Inn. Check their place out – Steve and I highly recommend it for visits in that region, which we have done many times when attending the North Atlantic Blues Fest in summer. During our first time staying at the LimeRock Inn, PJ did something special for us. He knew Steve and I were taking a sail boat ride in the afternoon, so he hiked out to one of his viewing spots and took a photo of us on the boat as it was sailing by. We didn’t know he was there, so when we arrived to our room that evening, the photo was already printed and matted for us sitting on our bedroom side table – what a surprise and gesture by PJ. This is how we were introduced to PJ Walter Photography, and many of his works are hanging in the hallways of the LimeRock Inn for their guests to enjoy. PJ has the skill of capturing the magic of mid-coast Maine. 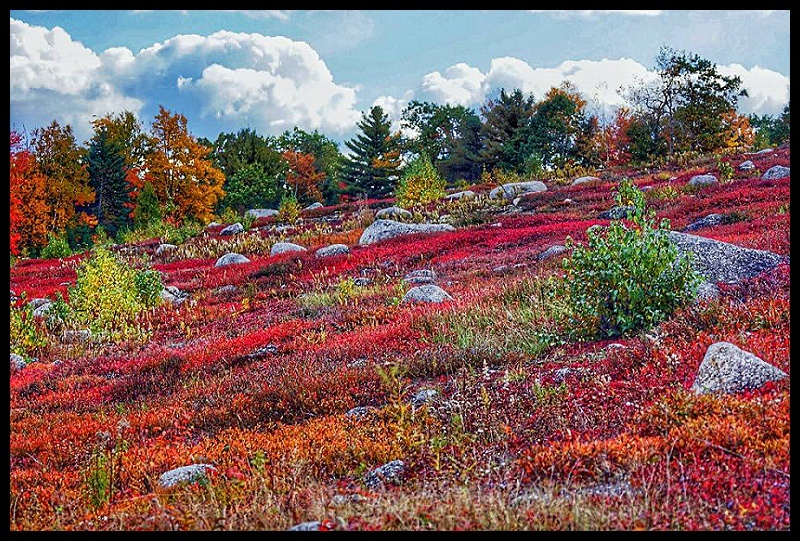 He was posting photos this month of various Maine landscapes, and stating along the way how Maine’s fall colors were incredible and probably the best around New England. But then on October 16th – PJ posted this brilliant photo below. It blew my mind. “Interesting that the colors are in the ground cover as well as the trees. 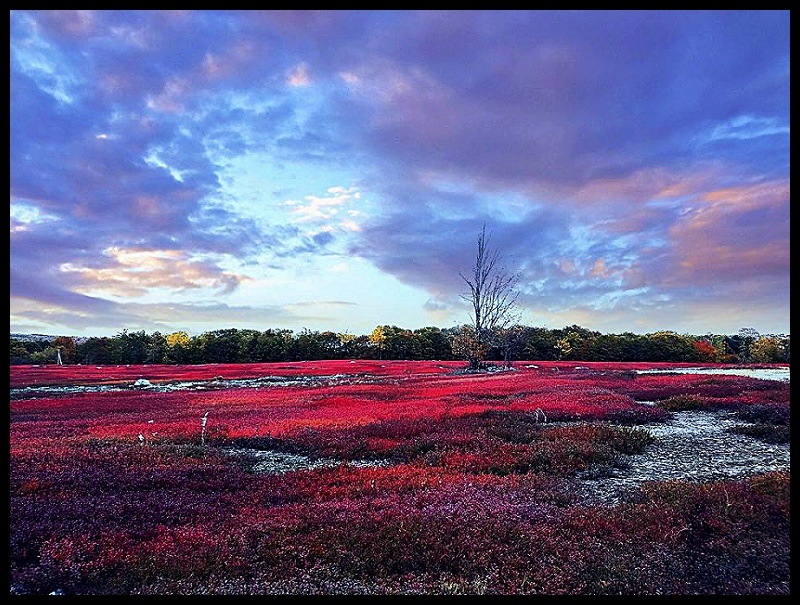 PJ responded to the question by providing a link explaining why the ground color is painted in red (see Wild About Blueberries blog), and also gave a hint of the location, posting it as: Route 1 just north of Bucksport. His photo was shared over 55 times and a local television station in Maine shared it one evening. One may argue he should have kept it so well guarded to avoid a non-credit situation, but how can one not share such a beautiful sight? We are so glad he posted this photo and many others this season which has been particularly colorful from here to Maine. To see more of his professional photography – be sure to visit his website, PJ Walter Photography. As PJ pointed out to his fellow followers, the reds on the ground are wild low-growing blueberry bushes. Many people desire the red color in their fall landscape, and for years, the burning bush shrub (Euonymus alatus) was recommended for its bright scarlet color in autumn, but this plant is invasive. It spreads aggressively in the woodlands (where it stays green in coloring due to mostly shade situations) and overtakes areas, out competing local native plants. Blueberry bushes are the perfect alternative – giving your fruit in summer, and as you can see from PJ’s photo, the bonus of providing a powerhouse of red to scarlet coloring in the fall season, especially this year. While these shrubs are wild and low in Maine’s natural landscape – many blueberry shrubs can be purchased here in Connecticut which grow taller, from 3-6 feet. There are highbush, lowbush, and rabbiteye blueberries – and as long as you plant them in acidic soil they desire, blueberries are rewarding. 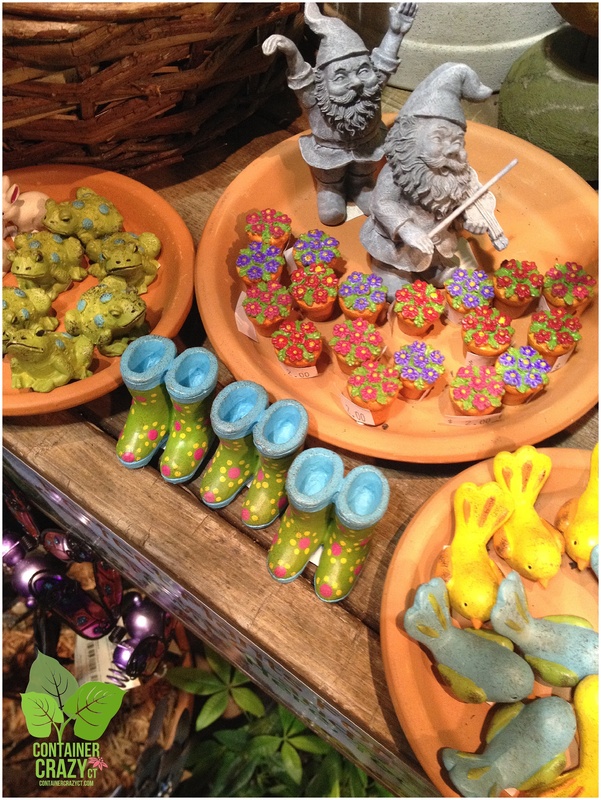 Ask your local nurseries about them next time you visit to browse their offerings. 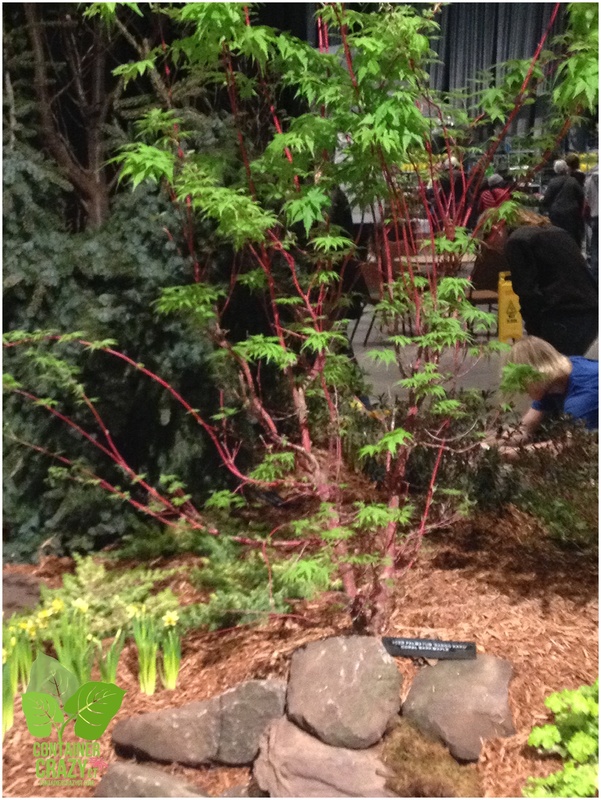 Another good option is planting a Japanese Maple (Acer palmatum) to get red color in your fall landscape. There are many varieties, heights, and styles to choose from, but what you may not notice is the red coloring of Japanese maple leaves intensify in the late fall, turning to a glowing red. Some cultivars you may be familiar with are the ‘Bloodgood’ maple which grows to about 15′ in 15 years, or ‘Crimson Queen’ with a more delicate, weeping form, and many more. Ask your local nursery staff to point them out to you next spring so you can capture some of that red in your landscape in time for next fall season. Japanese Maples like partial sun or filtered sun locations in moist, fertile, well-drained soil, and range in heights from six to twenty feet, so if you want a high level of red, plant one of these along with some blueberry bushes, and you are in business. And don’t forget, many smaller Japanese Maples are gorgeous in containers on your deck, they serve as elegant focal points, and may be protected in the winter months in garages to be returned outside the following season – something I did for several years with one of my smaller maples until I decided to plant it permanently in the landscape. Another red tree, which I just have to mention because I find them beautiful, is the Sourwood tree (also called Sorrel Tree, Oxydendrum arboreum). It grows long drooping clusters of bell-shaped white tiny flowers in summer, which I think are splendid, and in the fall, the leaves turn a plum-red color. You can see the remnants of the white flowers against the red when you observe the tree up-close. It is a slow-growing tree, reaching about 20′ tall, requires a infertile soil, and likes full sun. I don’t see them often in landscapes, but when I do, and it is in the fall – the color is striking on the finely textured foliage. There is one located in Northampton, MA by a walkway which I took photos of this summer and Instagramed by Cathy T – I will track down those photos for you soon to post here later. Sugar Maple spotted in Wethersfield, CT.
One afternoon while babysitting my niece, I drove past this maple on my sister’s street in Wethersfield, CT. My gosh, I had to walk to it to take photos. 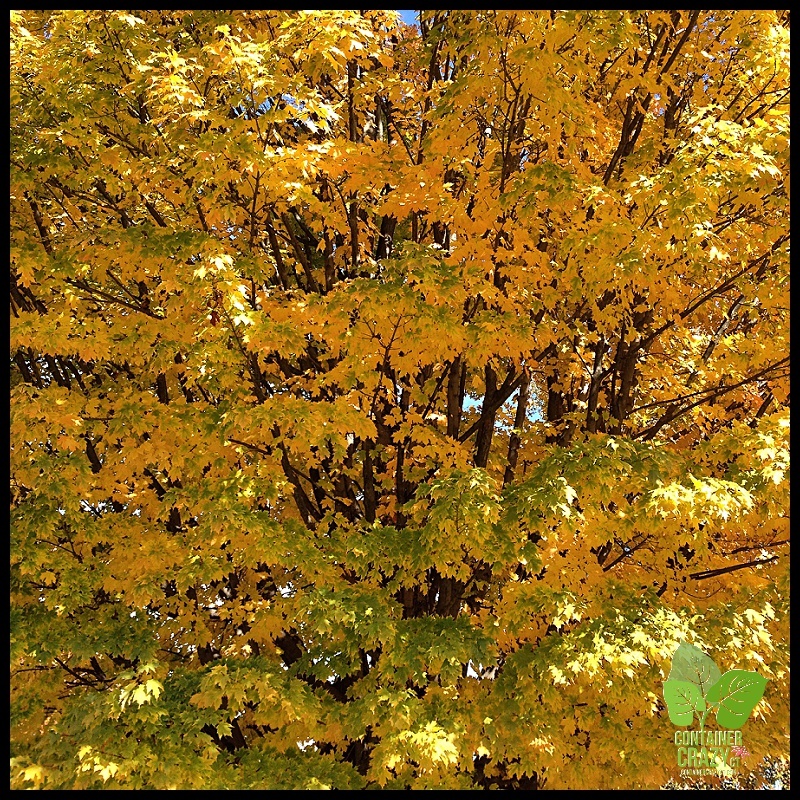 Sugar Maples (Acer saccharum) make an impact when in full golden color – and this year in Connecticut, they have been breathtaking. When my sister arrived home from work, I told her immediately, “I went down the street to take photos of that maple – its glowing.” She excitedly responded with, “I am so glad you said that; when driving down the hill, as the sun hits it – it is absolutely beautiful every year.” The tone in her response was as if she way saying, gosh, you noticed it too – that emotion you feel when you see a colorful autumn tree highlighted by the sun. It is moments like that when you embrace fall. 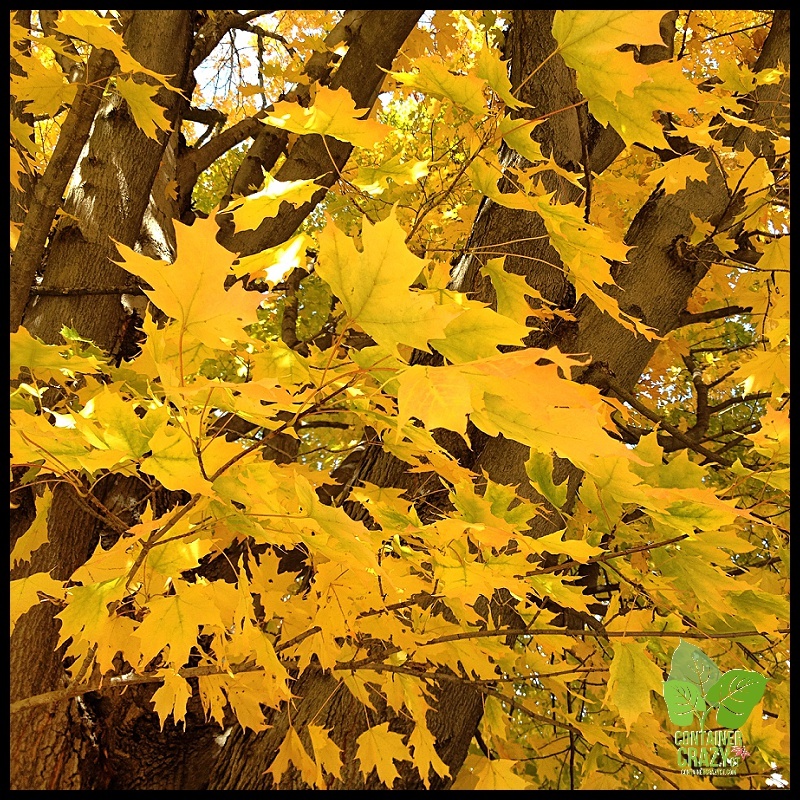 It helps to prepare for the oncoming winter by providing a sense of transition – and the Sugar Maple is one to have for oranges and golden yellows in your landscape. It prefers full sun and moist, fertile, well-drained soil and can grow up to 60 feet tall and 40 feet wide. Although this one was located by a sidewalk, these trees do not like poor soil or road salt and do best away from those scenarios. They require a lot of space since they are big trees. Another yellow to be had in the landscape is by way of the Ginkgo biloba (a deciduous conifer), which most people are familiar with due to its unique fan-shaped leaves and its medicinal benefits – however, did you know it turns a yellow color in the fall? Additionally, it is very tough, can take difficult locations, and the yellow leave color in the fall is lovely – until all the leaves drop which can happen quickly – as in one day when frost hits it – but it is worth it up til that point, plus you may choose to collect the fallen leaves for crafts. Ginkgo trees do not have serious pest issues. They tolerate road salt and drought, unlike the sugar maples. Oh, and if you go buy a Ginkgo at the nursery, remember to ask for only male trees (‘Shangri-La’ or ‘Autumn Gold’ are examples) because they do not produce fruit – the fruit on the female trees are stinky and people find the scent unbearable. One afternoon, sitting inside by my kitchen slider, I was mesmerized by the colors of the trees in my own backyard – our carved pumpkins were a nice orange, and I thought, “Gosh, I wish I could capture those tree background colors in a photo.” This photo above was my ridiculous lame attempt with my iPhone. I guess the autumn colors will be sealed in our minds, or if we are lucky enough – captured by people, like PJ Walter, to be viewed forever. Here’s another one of his shots. Thank you PJ for the permission to post and show your photos. 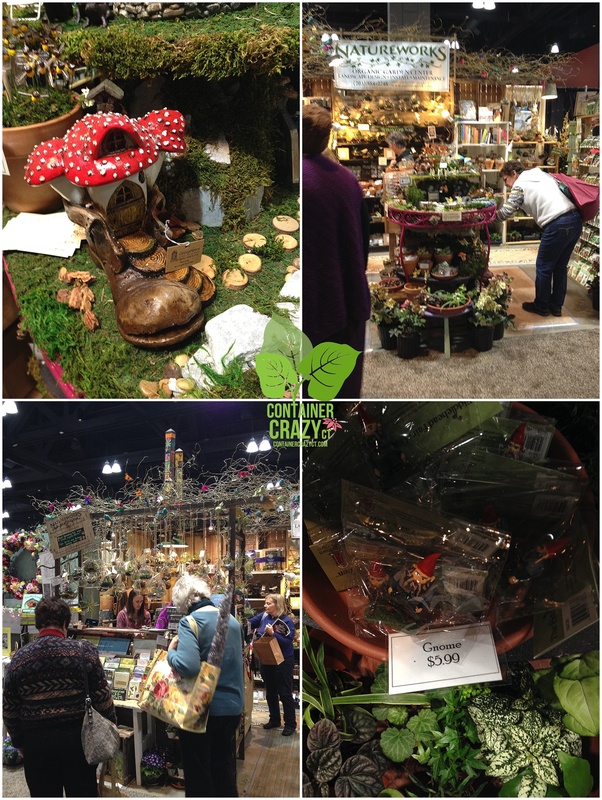 In case you didn’t make it to the CT Flower and Garden show last week in Hartford, here are the photos I quickly snapped from my iPhone. 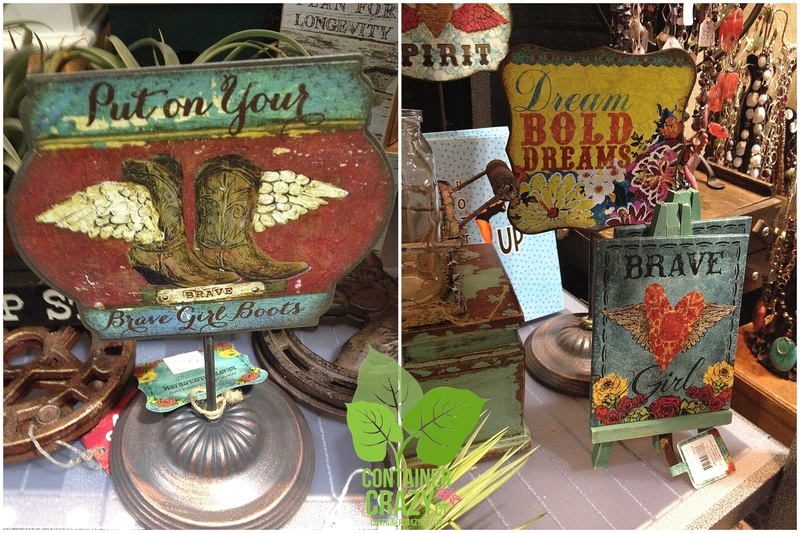 The funny thing is I thought I may not take as many photos as usual – but it didn’t take long for me to do so – There were so many wonderful photos to capture of landscape displays, garden art, handcrafted items, and more. 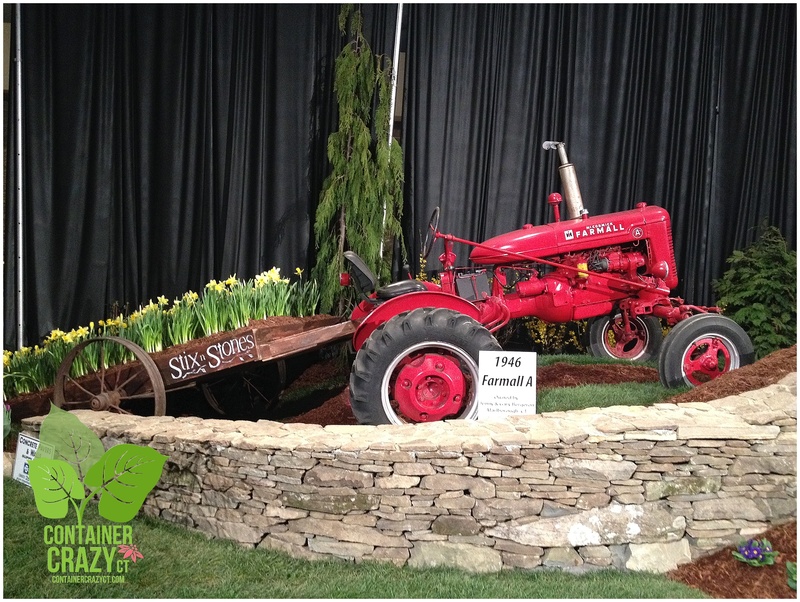 The first landscape display we saw was by “Supreme Landscapes.” I enjoyed the wooden structure, the clever fountain made with an old rusty re-purposed gardening item, and the large boulders edging the beds, which I reached down to touch to see if they were real – and they were. Amazing what they truck in and place at these displays. And I couldn’t agree more. The staircase led your eyes up to a little wooden cabin, a place you surely would want to visit if you found it surrounded by flowering plants and gentle sounds of water falling from a nearby fountain. 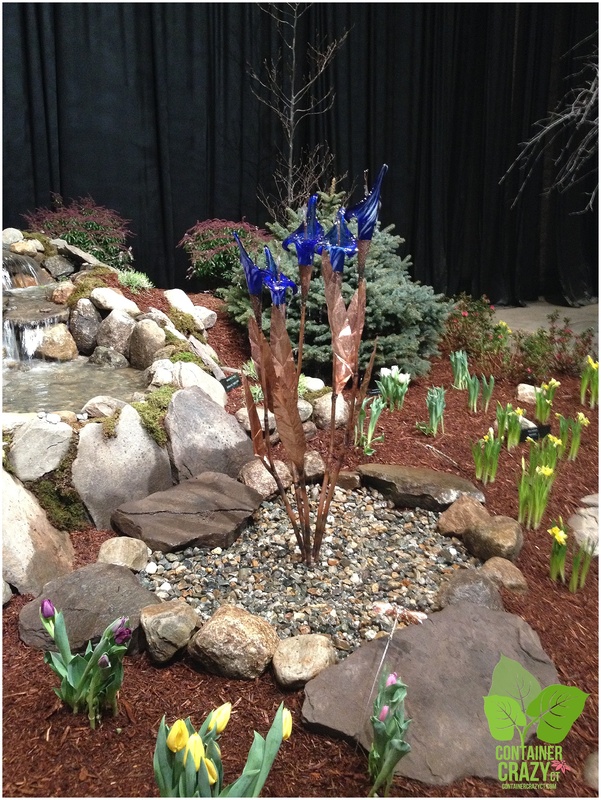 It was a wonderful scene to greet you as you entered the main landscape area at the show. Around the bend, we came across “Aqua Scapes of CT” – Talk about a pagoda! 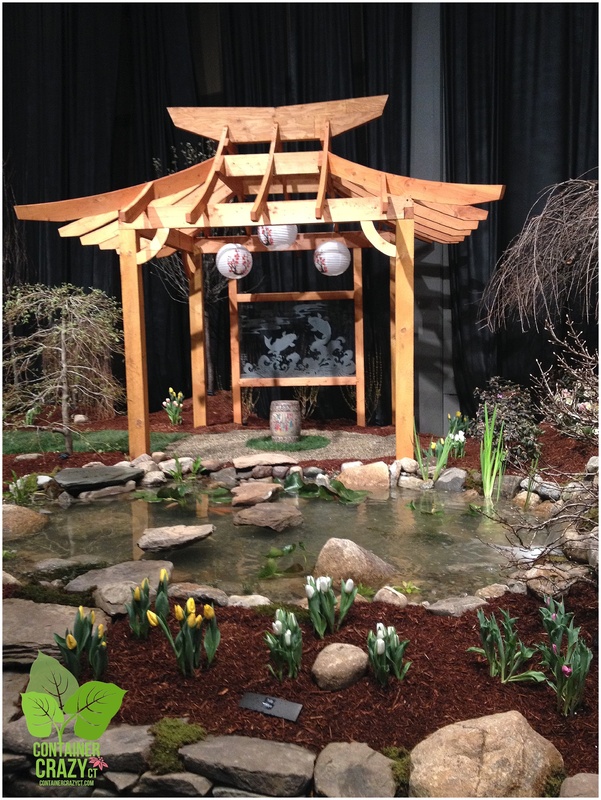 The main features at this display were all about water scenes, waterfalls, ponds, koi fish, and copper water features. Here we were greeted by Mark Zinni of WFSB Channel 3; he noticed my small suitcase, and asked if I was coming from the airport. When I explained I brought a suitcase along to pack my garden nick-knacks to be purchased at the show, he interviewed me along with my friend, Linda. It was aired later that evening. 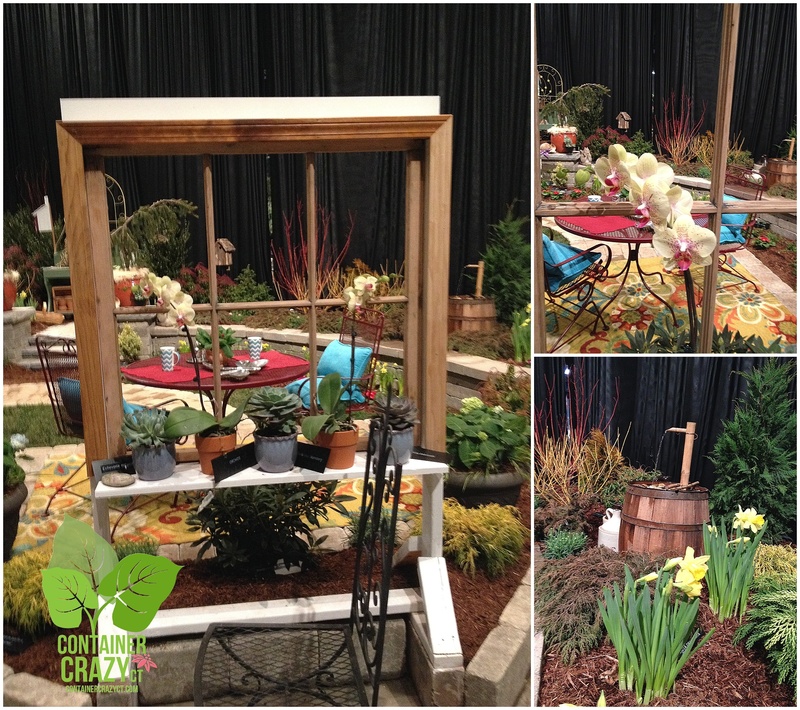 As I approached this display, it was the special touches which impressed me most – The window frame with decor, container gardens situated just perfectly to frame areas, a little sitting area with table and chairs, etc. But as I browsed more of the various features, I could not find the sign to indicate which designer it was. 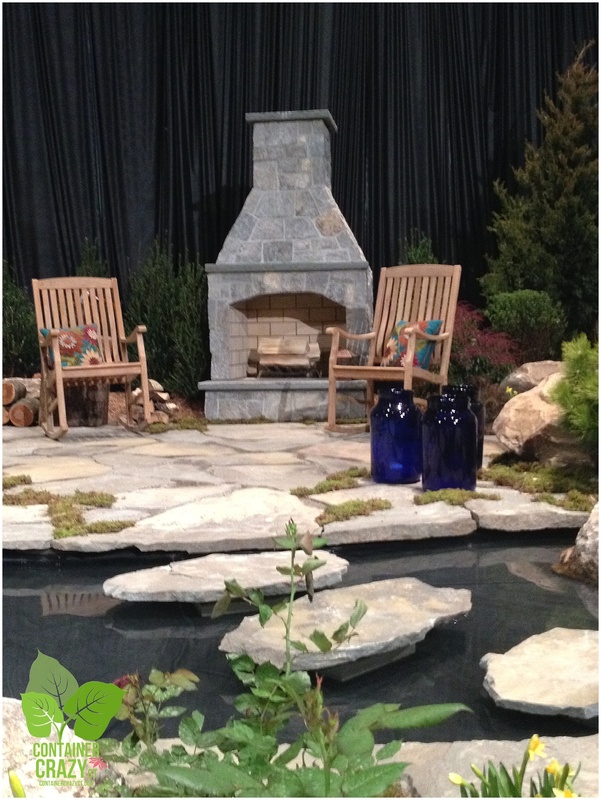 Linda looked it up for me in the garden show book, and it was a pleasure to discover all was designed by a friend, Diane of “Encore Landscaping.” She and I have chatted about design in the past. 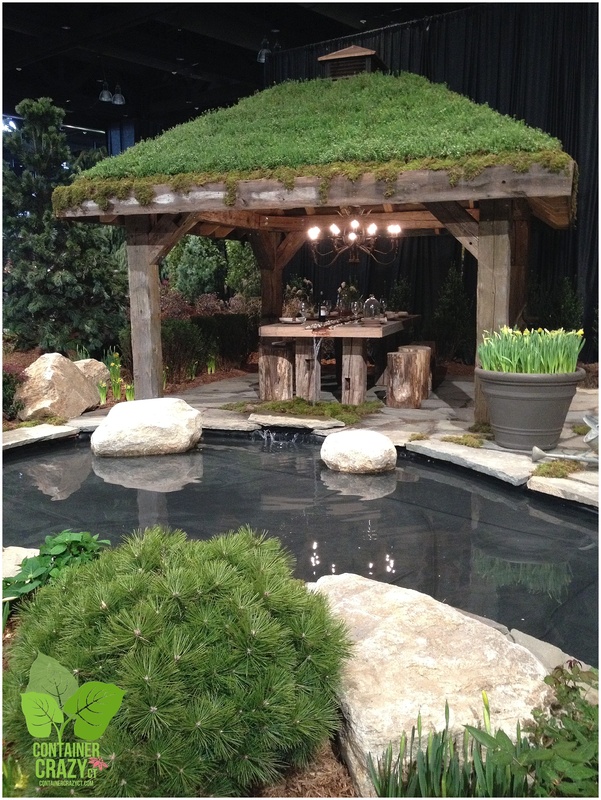 The greenroof, dining table with running water spilling down the ends, and the water features were spectacular. If I remember correctly, this was the far right part of their design – but you see so much, as I browse the photos – I have to rethink – but pretty sure it was. 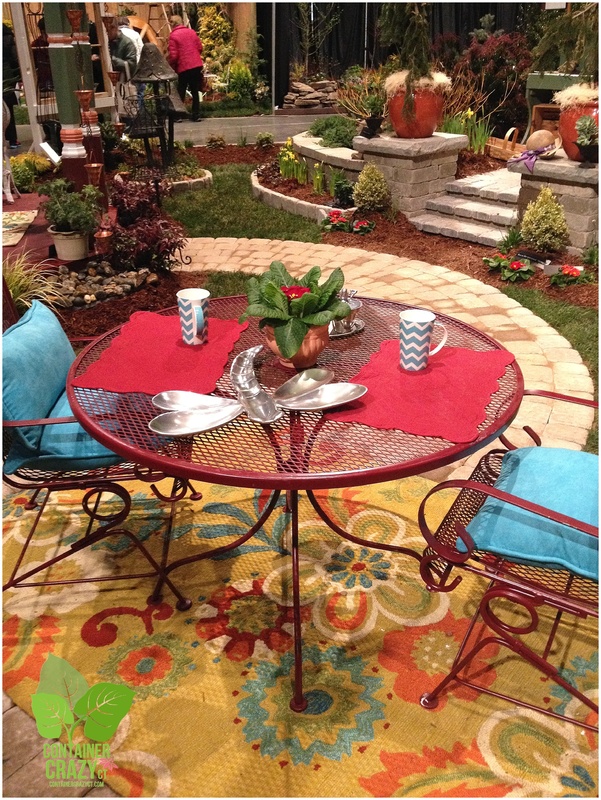 Loved the big pots here and there, the sitting area, etc. Who wouldn’t love that scene above tho – I would dine at that table every night during the summer – even if I was eating alone. Again – it is hard to remember exactly which display this was above, but I like the wood log sections and how they carefully placed them as a border’s edge. I apologize for not noting the name of this display – but wow – they think of everything! 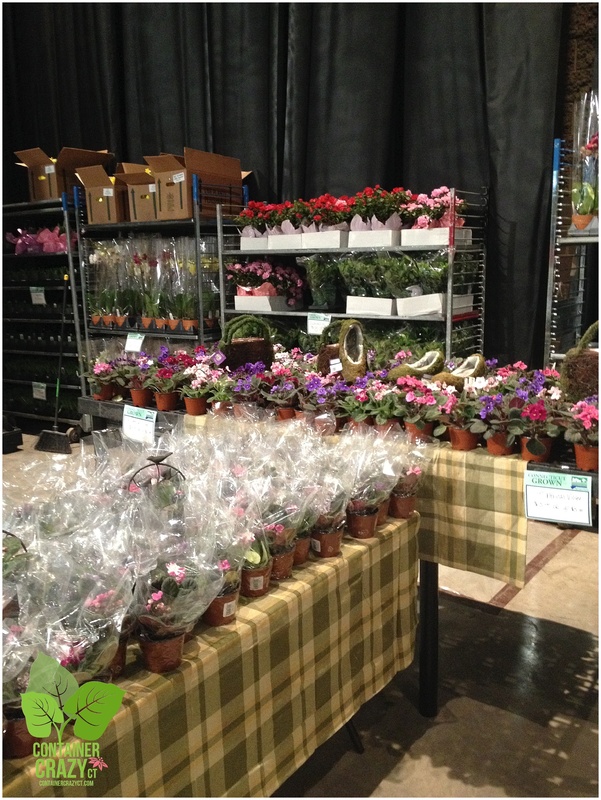 PLANTS FOR SALE BY GREENHOUSE GROWERS ASSOC. 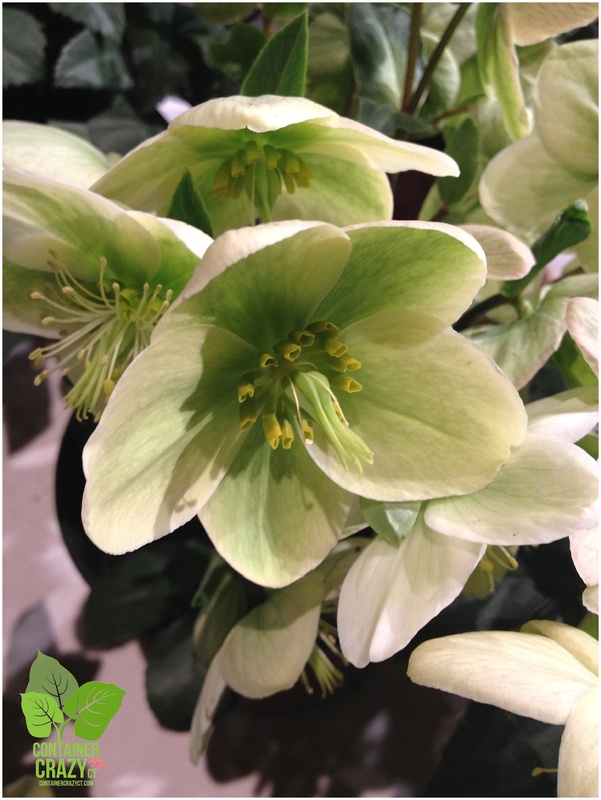 Hellebore at Greenhouse Growers Assoc. 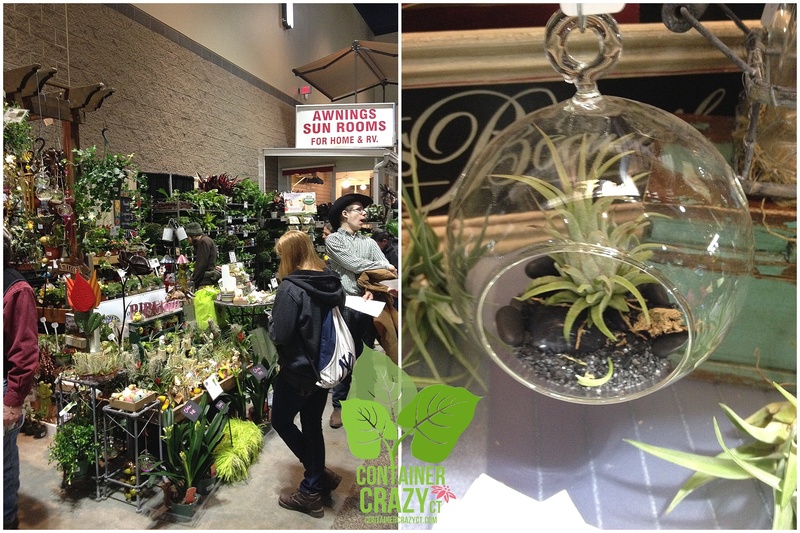 Mentioned previously in a blog post about the upcoming show, there are plants galore you may purchase at the show. One area showcases several florists and this is where I got a close up photo of an early blooming perennial, Hellebore. This will be the first one to show its blooms and foliage after our abundance of snow melts in the spring – sometimes this perennial pops up while there is some snow left standing on the ground too. The CT Greenhouse Growers Association is a trade organization representing the interests of this state’s 150-plus greenhouse growers. Here comes the Mini’s! 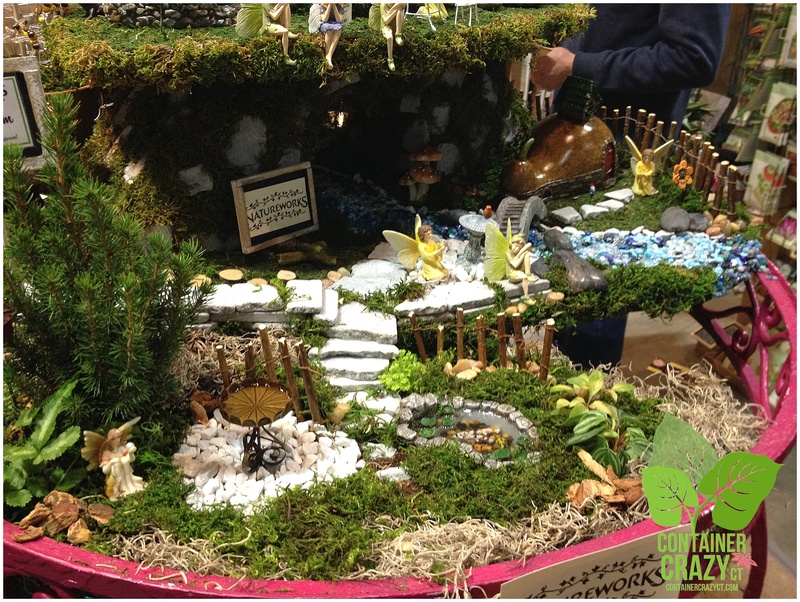 There were so many booths showcasing and offering miniature garden decor – I visited at least 3 at the show – it is a popular activity in the gardening world, even some landscape displays had miniature scenes arranged within the garden beds. 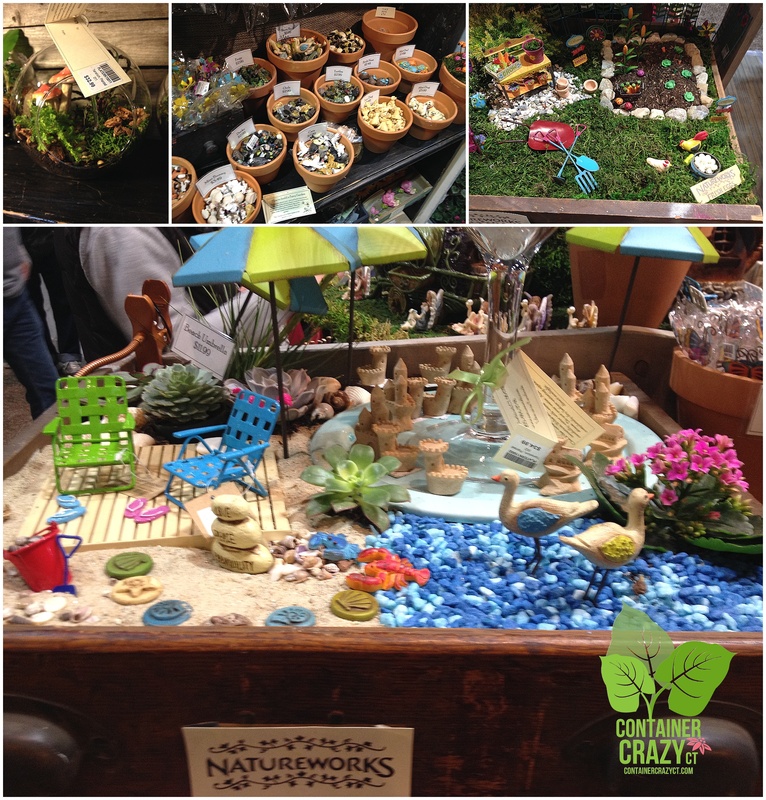 Natureworks is a very popular garden center in CT, and they had many minis along with other garden art. 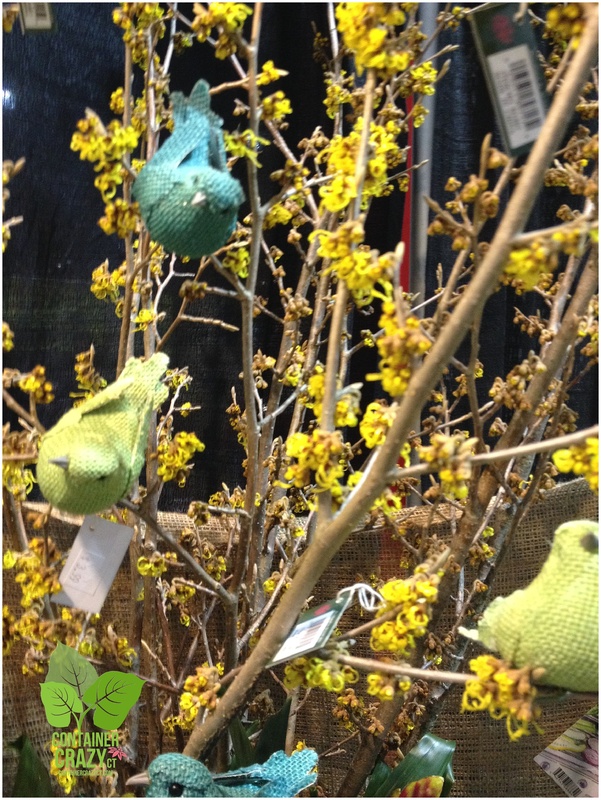 I wish I could remember who’s booth the following photos of the mini barn and vivid mini arrangements were from – because they had adorable miniature garden embellishments as well. 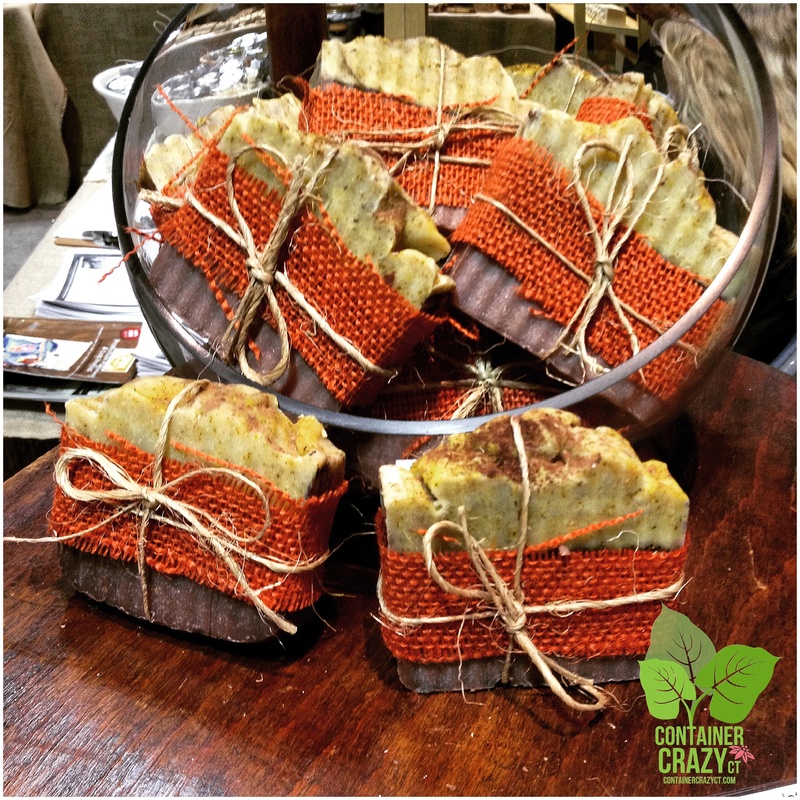 Every year at the show – I am sure to pick up a few bars of handmade soaps – who can resist the wonderful scents? 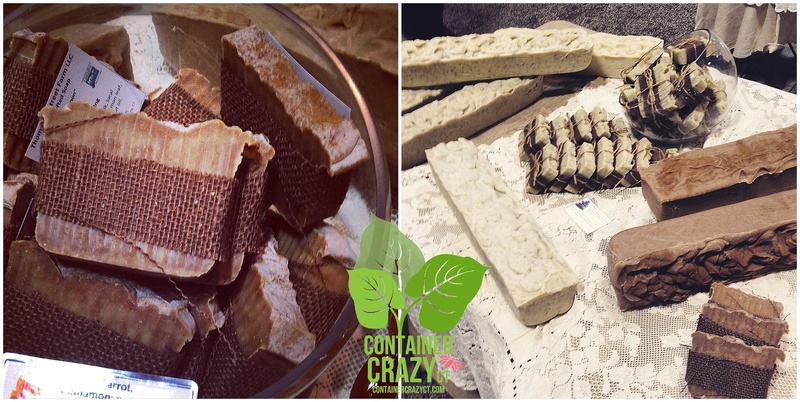 Thompson Street Farm had an great display of their soaps – I loved how Brenda Sullivan, the owner, showed huge uncut bars of the soap – and she told me that one time an online shopper thought her soaps were fudge – No wonder, they are scrumptious to look at as well as smell. She is located at 49 Thompson Street in South Glastonbury, CT, and offers more than handcrafted herbal and floral soaps, she has some leafy greens and veggies/herbs per her business card. Her soaps were a definite purchase and added to my suitcase of goodies as I shopped more at the show. 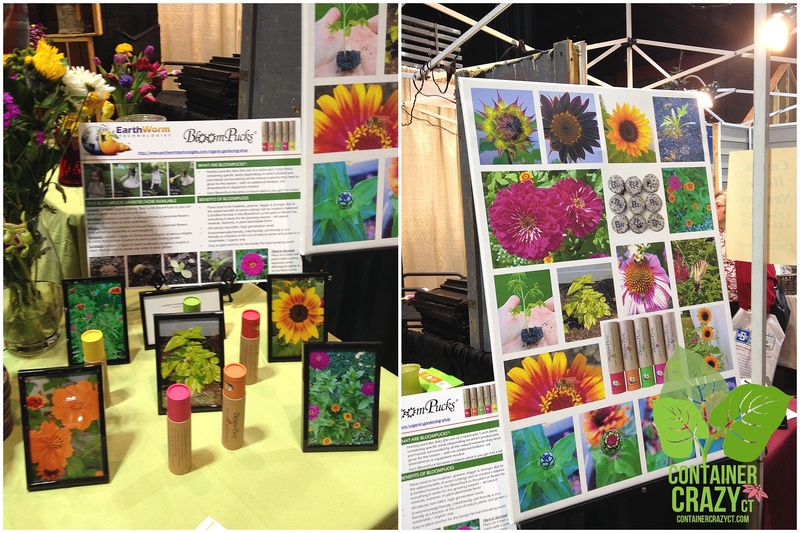 Steven Devloo, Founder and CEO of Earthworm Technologies, impressed us with his colorful display and talk about his eco-friendly products utilizing earthworms and vermicomposted food scraps to create fertilizer boosts for potted plants. Visit his website to check out his small capsules of pill like shaped fertilizers which are inserted into the soil for indoor and outdoor plants, and for use in vases to feed freshly cut flowers. He’s onto something here! Earthworm Technologies are based in Stamford, CT.
Sea Green Organic’s liquid fertilizer may be used as a root drench, foliar feed or as a soil injection. It is mixed in water for application. I’ll let you know about the results this summer. 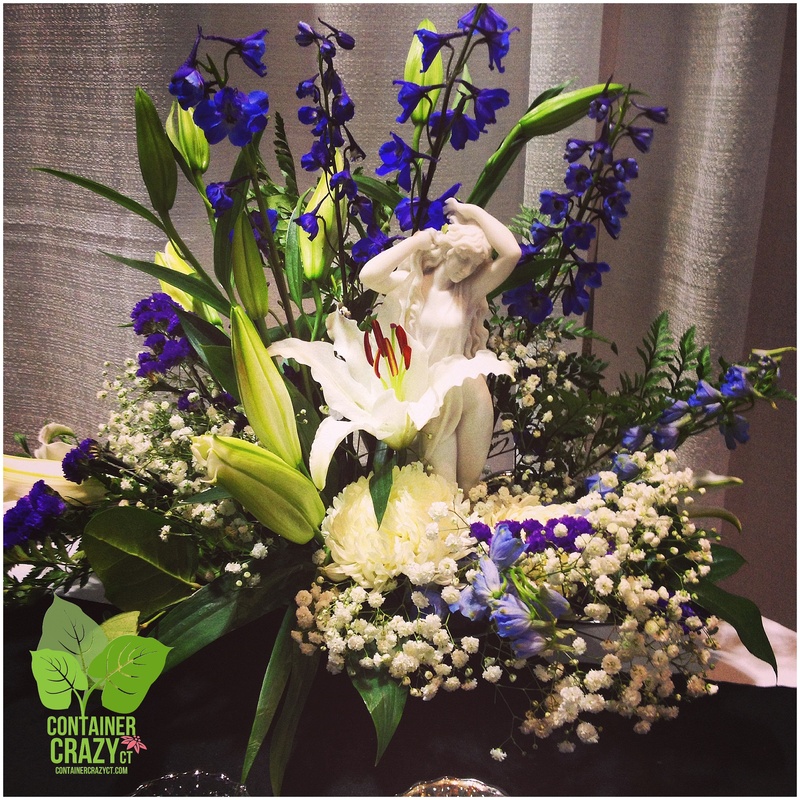 And, I decided to save the best photo for last – beautiful Delphiniums with white flowers in this gorgeous floral arrangement showcased at the design competition. I fell in love with this one and the other photo shown below of the autumn colors in another display – just wonderful to see these colors this year especially during our very snow filled winter. 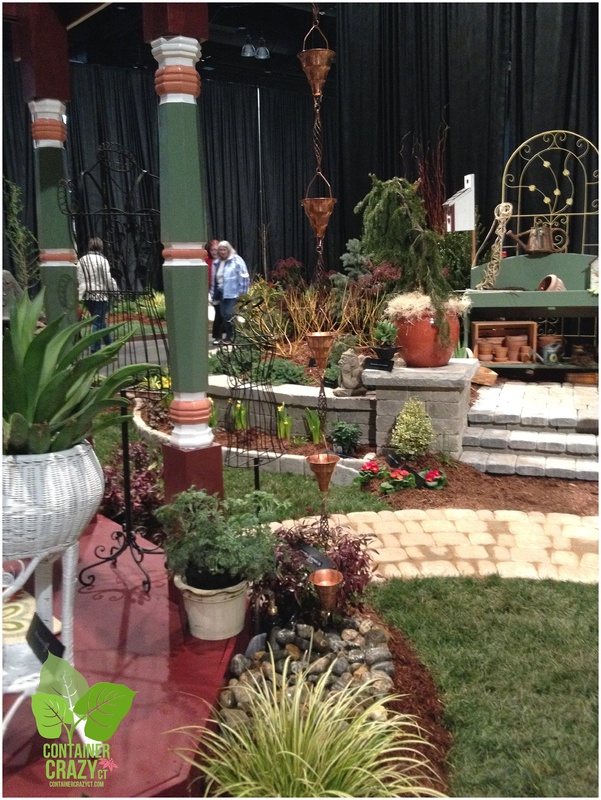 The CT Flower and Garden Show is held every February at the Connecticut Convention Center in downtown Hartford. As for my suitcase which I brought along to load up with goodies – by the end of the day, it was filled with gardening pamphlets, a bottle of Sea Green Organic fertilizer, several decorative wrought-iron hooks for hanging baskets by Garden Iron of Covington, KY, several bars of handcrafted soaps by Thompson Street Farm, zinc-plated plant markers from Ironwood Tools, a birdhouse (yup, it fit), along with a small box of decorative greeting cards with bird photos on them, and sachets of lavender. Things were smelling good in there by the time I arrived home in the spirit for spring and less focused on winter. 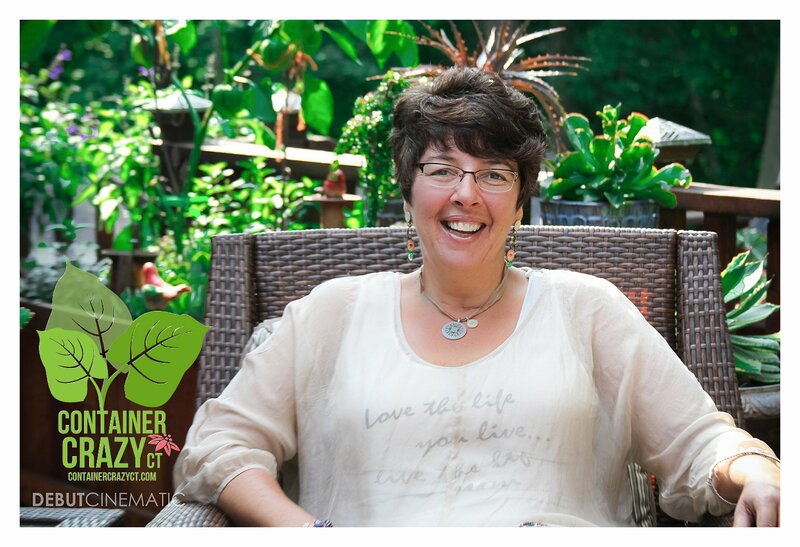 Cathy Testa, owner of Cathy T’s Landscape Designs and Container Crazy CT, completed the Master Gardener Program in September of 2010. 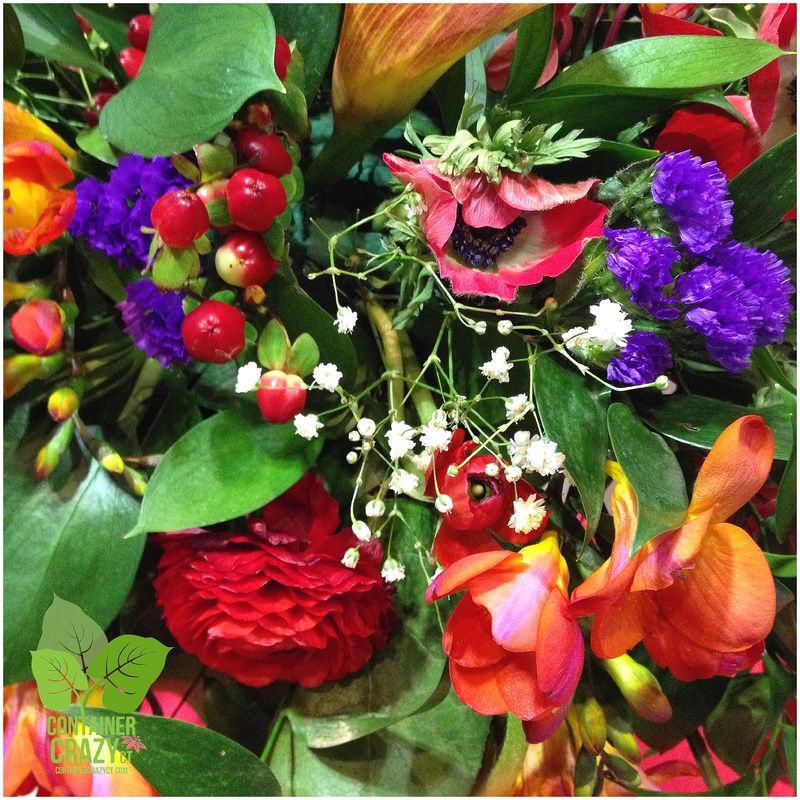 She holds an Associates of Applied Science degree in Horticulture with a concentration in Floriculture from the University of Connecticut. 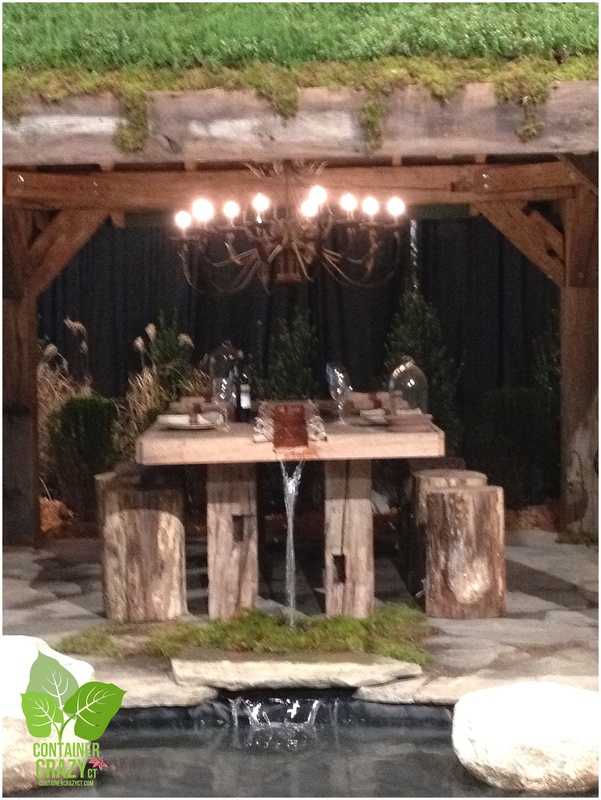 During her studies, she managed a private nursery for a design install business in Bloomfield, CT. 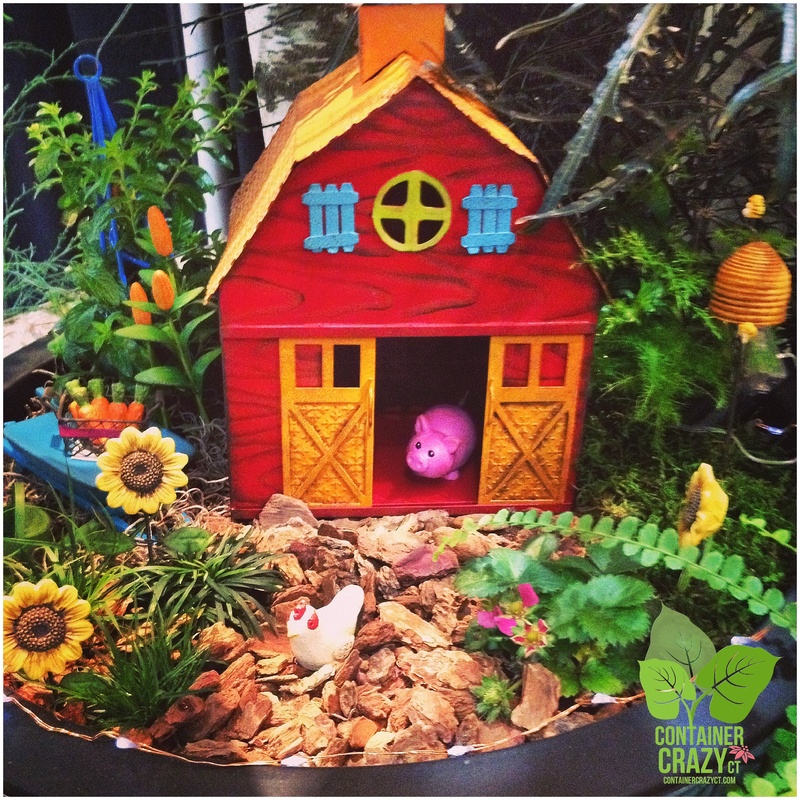 Upon graduation, Cathy was employed at the Garden Barn and Nursery in Vernon, CT for two years before starting her own business, which she has been operating for eight years. She served on the Board of the Connecticut Horticulture Society for two years on a volunteer basis, and continued her studies via programs such as the UCONN Perennial Conference. Her current business services include container gardening design and installations for homes and retail business store fronts, small garden design consultations, blog writing which includes freelance writing for local farmers market blogs, and she offers regular hands-on classes on topics pertaining to combining nature with art from her classroom located in Broad Brook, CT. 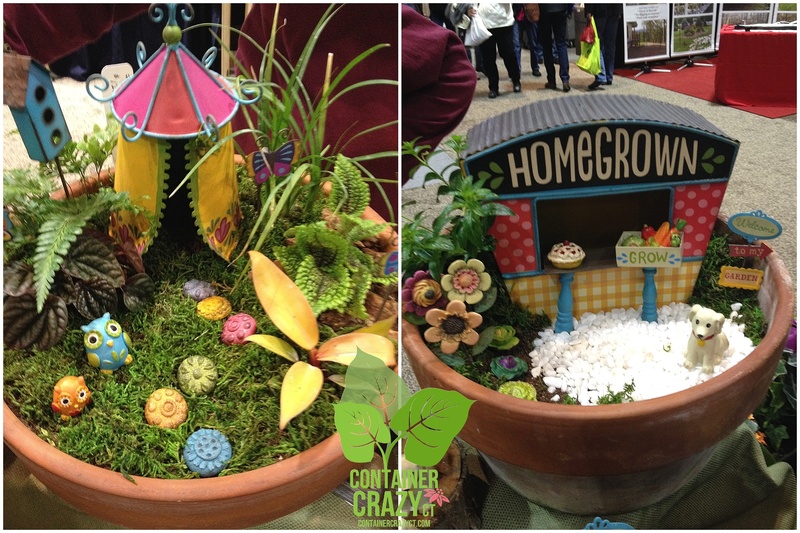 Her attention to plant details, growth requirements, and steps for success with container gardening, along with a passion for plants and their ornamental beauty, has contributed to her reputation of being “container crazy” in her area of services. Cathy has also appeared on the CT Style television program, participated on the CT Food & Farm podcast, and regularly speaks at Garden Clubs. To see a history of Cathy Testa’s horticultural activity the past few years, click on the ABOUT link.